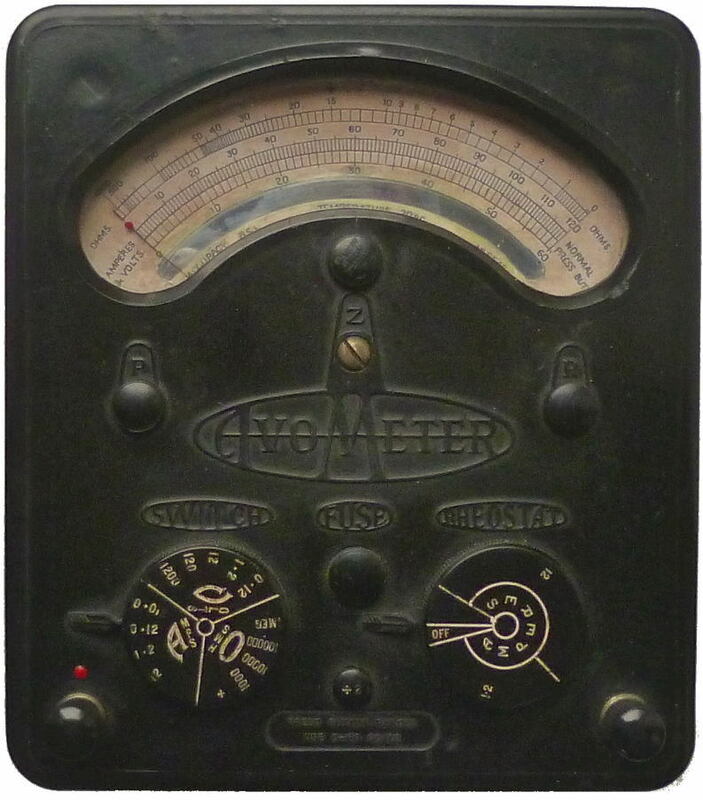 This page attempts to provide details of the full size multimeter's based upon the design first manufactured in 1923. A fairly comprehensive list of all the models produced can be seen in the Notes section at the bottom of this page. The P and R adjusters are used to compensate for the Potential (voltage) and the internal Resistance of the internal cells used on the resistance measurement ranges. 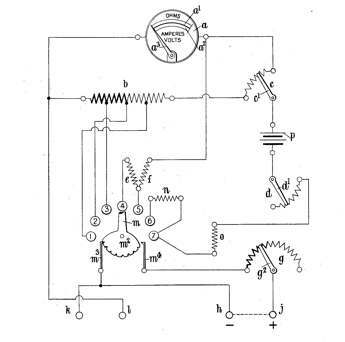 This is one of the images from the patent application made by Donald Macadie in 1923. 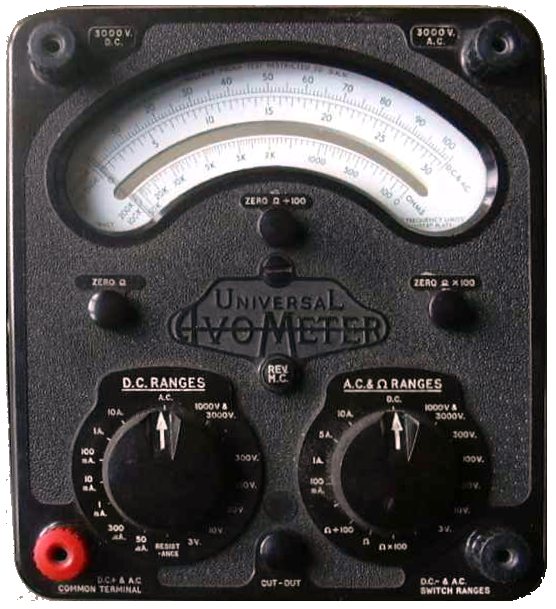 The basic design incorporating a universal shunt, internal battery and calibrated scale plate for resistance measurement has been incorporated in all subsequent models. A fuse wired in series with meter. The front panel now manufactured from a one piece Bakelite moulding and the casing made of aluminium. 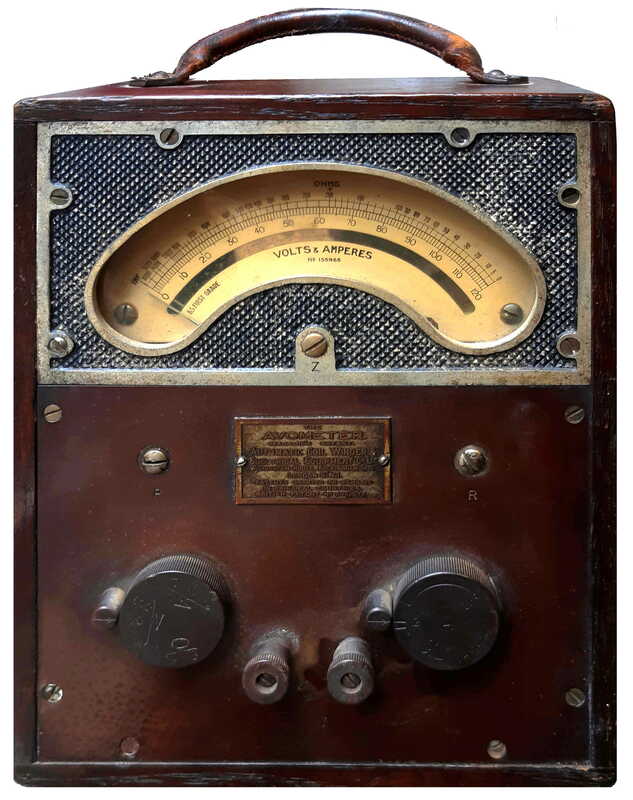 The later model 6 introduced around 1934/5 has a divide by 2 button effectively doubling the number of ranges. and terminals for the test leads. 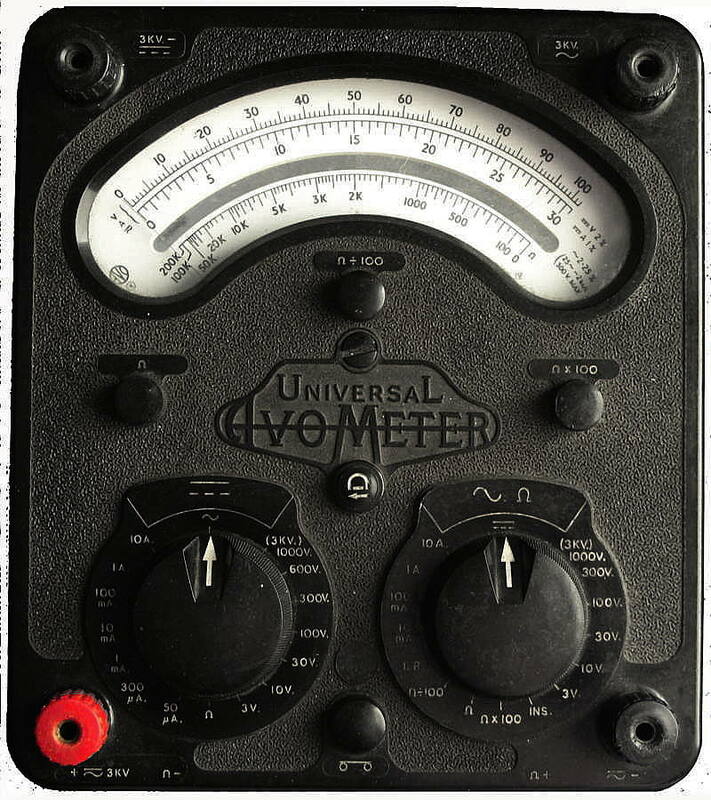 The meter used an inbuilt 1.5 volt rectangular cell for the two lower resistance ranges (Siemens type T or equivalent). This was accommodated in a wooden recess on the underside of the instrument. Added AC capability using transformer and copper oxide meter rectifier rectifier. 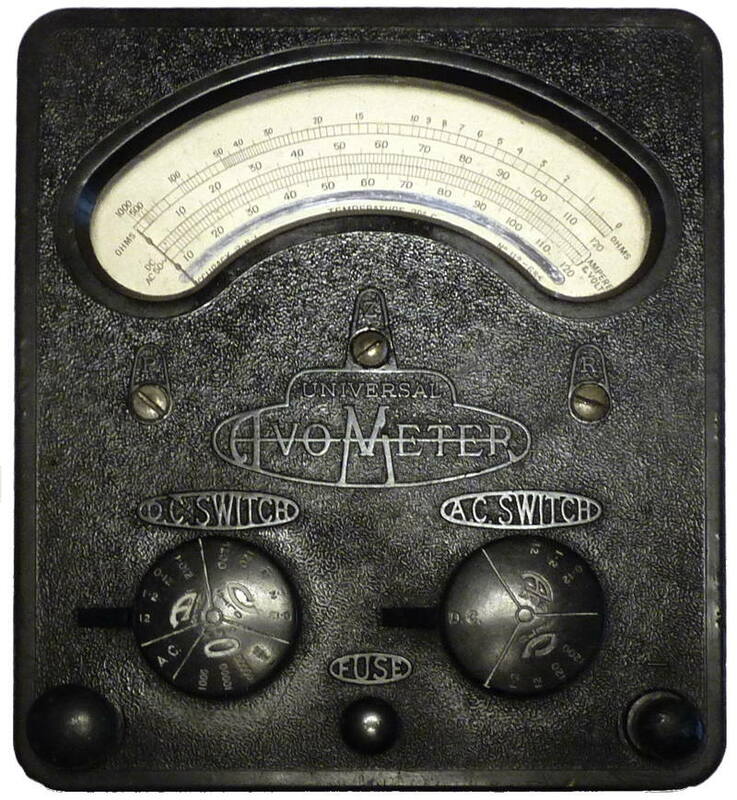 The meter used an inbuilt 1.5 volt rectangular cell for the two lower resistance ranges (Siemens type T or equivalent). This was accommodated in a wooden recess on the underside of the instrument. An external voltage was needed for the higher ranges. 100k, 1M ohm (1.25, 12.5k ohm center) with external power. Introduced 1936. The first one shown here was made in 1944 and the second in 1945. Note the differences in the front panel mouldings. The second includes "MODEL 7 UNIVERSAL" in a sans serif font rather than the more usual "UNIVERSAL"
Note also that the zero adjuster on the earlier model is made of brass and the later ones are black Bakelite. 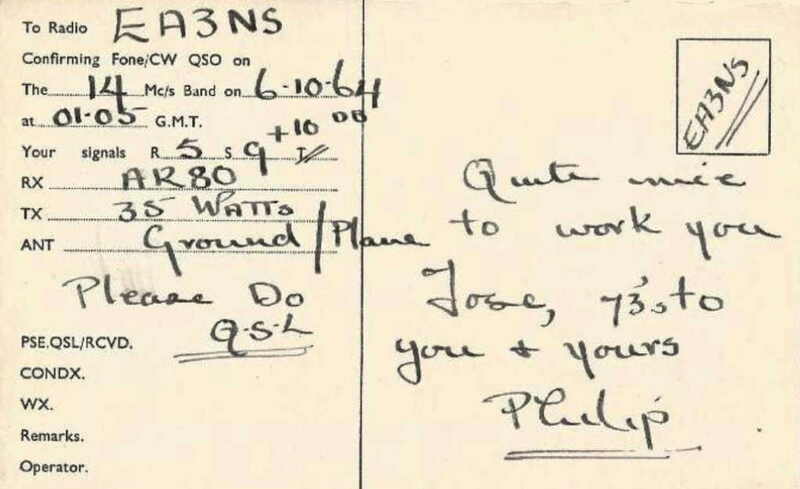 This seems to be true for all instruments made after 1944 or thereabouts. 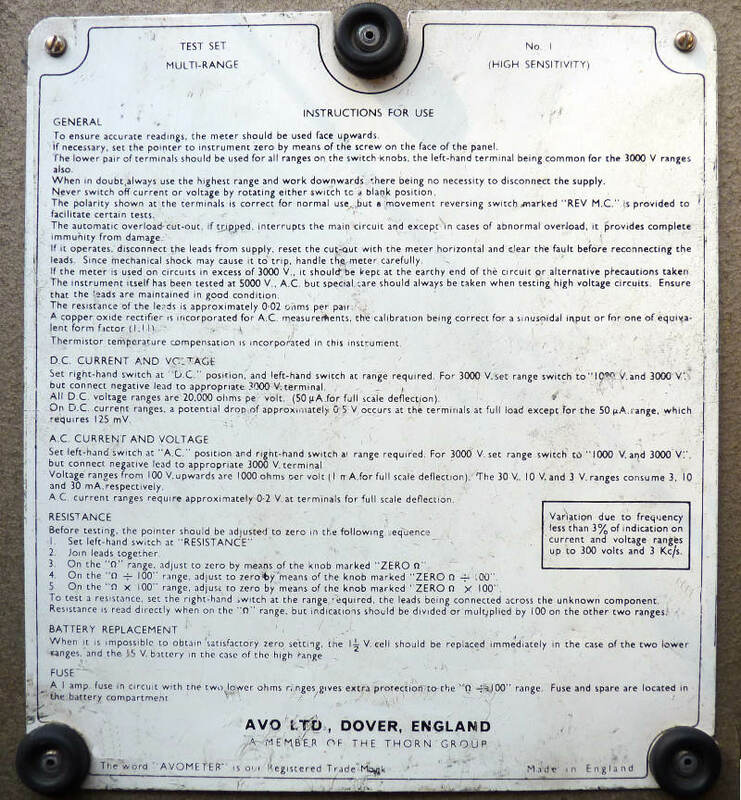 Versions of this meter were made for the British Army and labelled with the part number ZD00021. Bakelite or aluminium case with battery cover designed to hold the test prods. 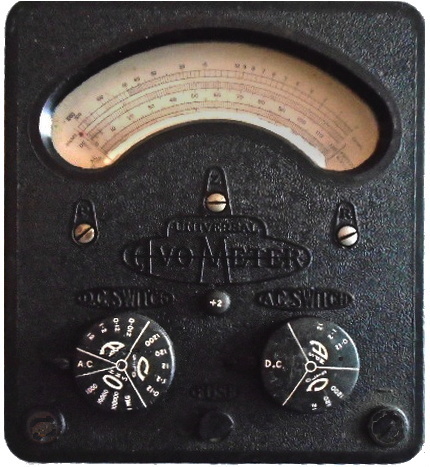 After 1948 (or late 1947) Alnico block magnets used for the meter rather than the horse shoe of the earlier instruments. 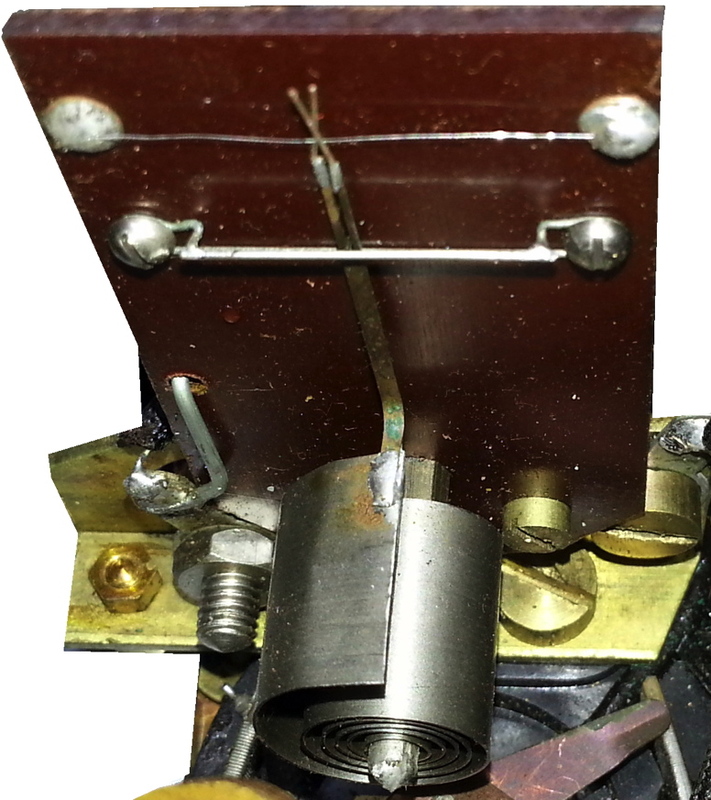 It seems that meterers with Alnico magnets have an A in the serial number. AVO used a standard movement design for most products, but with small variations. This were referred to as the Movement 45 (1949/1950), which was superseded by Movement 46 (1965). 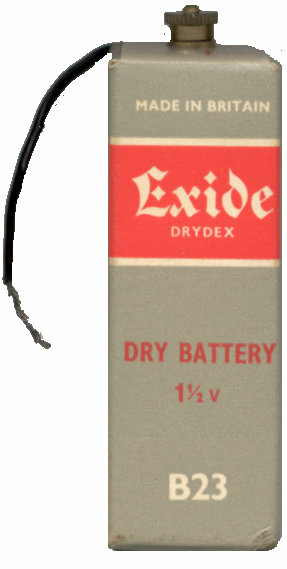 The rectangular battery became obsolete many years ago and most owners resorted to soldering a U2 or equivalent cell in its place. 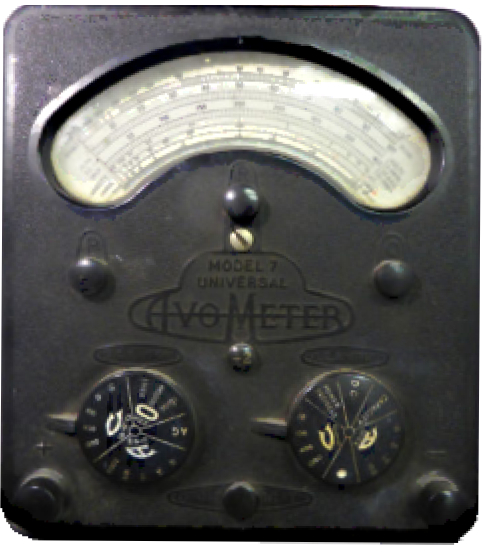 AVO manufactured a simple device with two contacts and two leads to enable a U2 or D size cell to be used in their model 7 and model 40 meters. 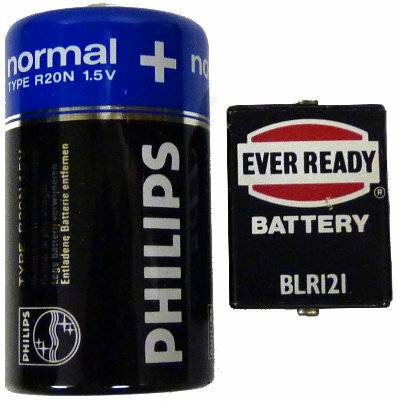 The 4.5 volt batteries are currently available but the simple modification shown here enables a readily available PP3 9Volt battery to be used. You can use an adapter which uses 3 AA cells as shown below, but beware that they are a very tight fit for the battery compartment and you will need to perform a little surgery to reduce the depth. I removed the labels and used a Dremmel tool to grind away a millimetre or two from the top and bottom edges visible here. 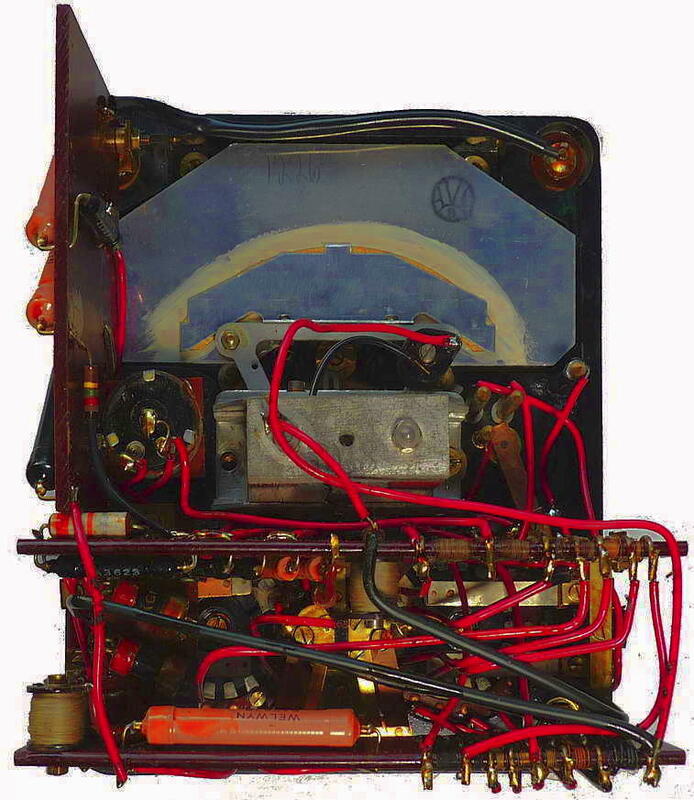 Introduced about 1952 and last manufactured 1986.
point during the 1950's, added power factor jacks for P.F. unit and red and black banana terminals in 1956. Last manufactured 1986. 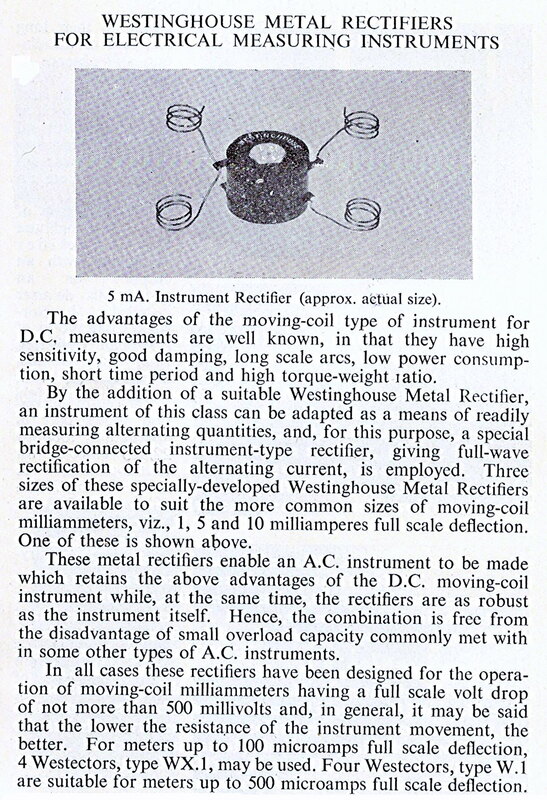 A multi-range A.C./D.C. Measuring Instrument providing 50 ranges of readings on a 5-in. hand-calibrated scale fitted with anti parallax mirror. Range selection is effected by means of two rotary, switches, which are electrically interlocked. Full scale deflection on voltage ranges is obtained with a consumption of I mA or 2 mA according to whether the -:- 2 press button is used or not. 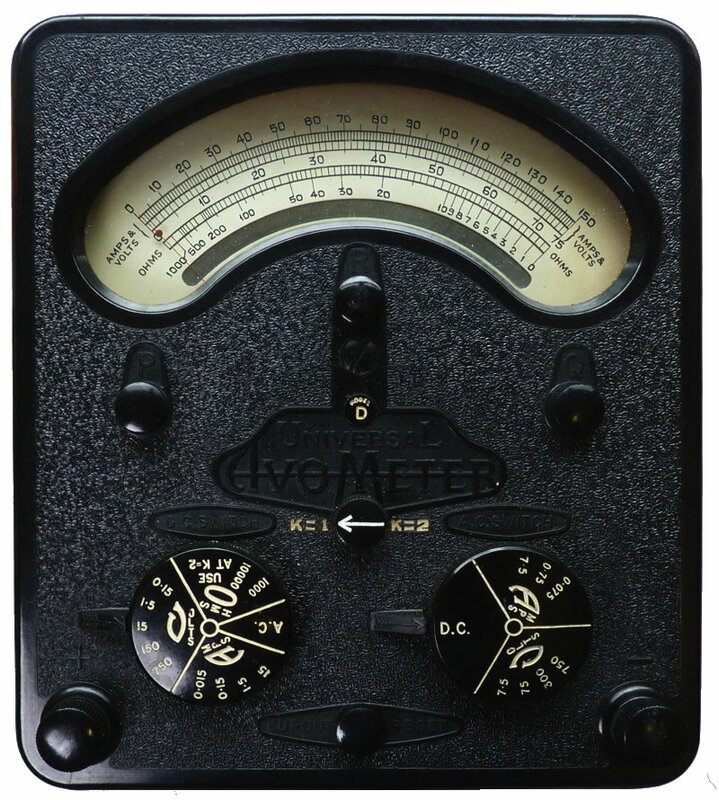 The total resistance of the meter is 500,000 ohms. 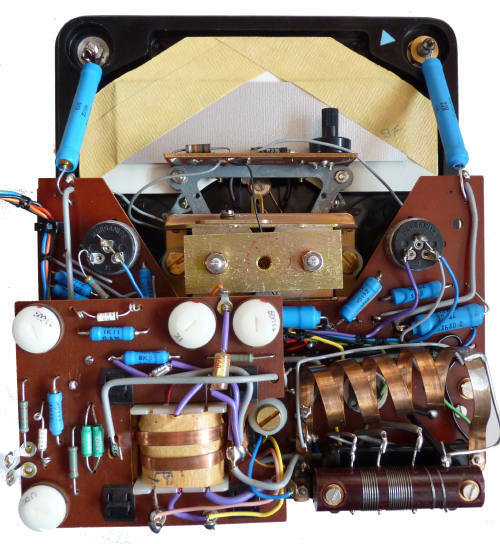 The instrument is self-contained, compact and portable, simple to operate and almost impossible to damage electrically. It is protected by an automatic cut-out against damage through severe overload. 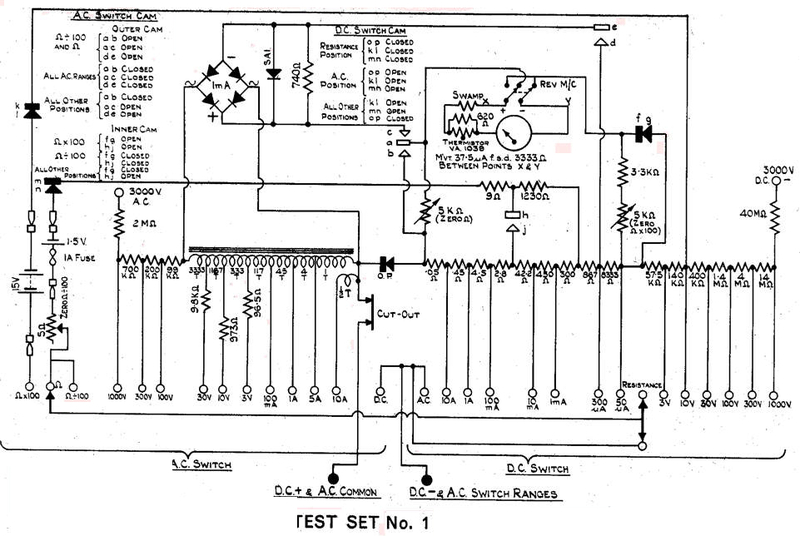 CURRENT: A.C. and D.C. 0 to 10 amps. VOLTAGE: A.C. and D:C. 0 to 1,000 volts. RESISTANCE: Up to 40 megohms. CAPACITY: 0.01 to 20 mFds. DECIBELS: -25dB to + 16dB. 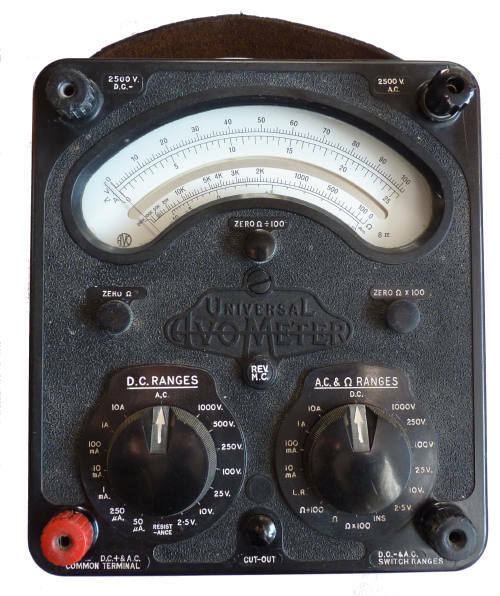 POWER FACTOR AND POWER can be measured in A.C. circuits by means of an external accessory (the Universal AvoMeter Power Factor and Wattage Unit). 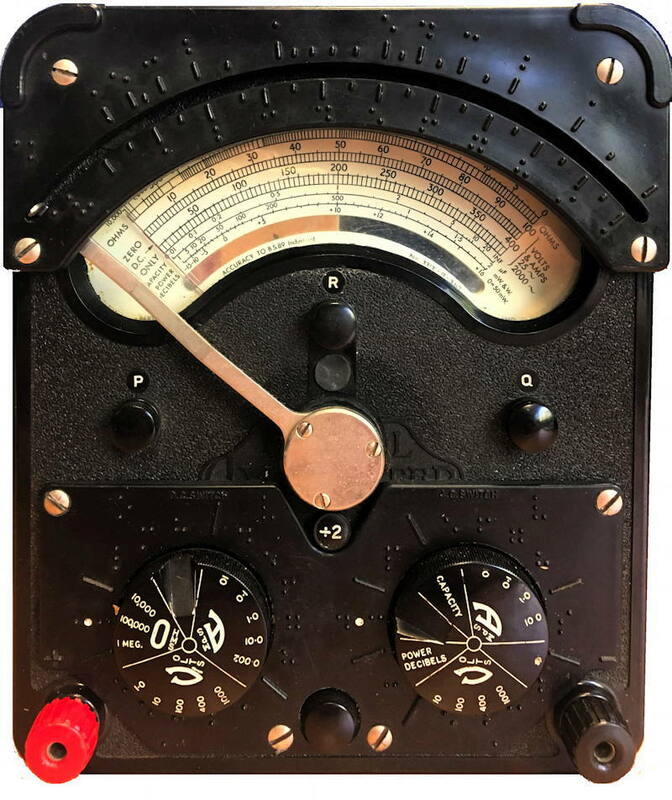 Two models of this Unit are available, one for use with the Model 7 Avo Meter and the other with the Model 40 AvoMeter, but in either case the Avo Meter must be a model fitted with sockets marked "P.F." for connection to the Unit. All recently produced Avo Meters have been fitted with these sockets. 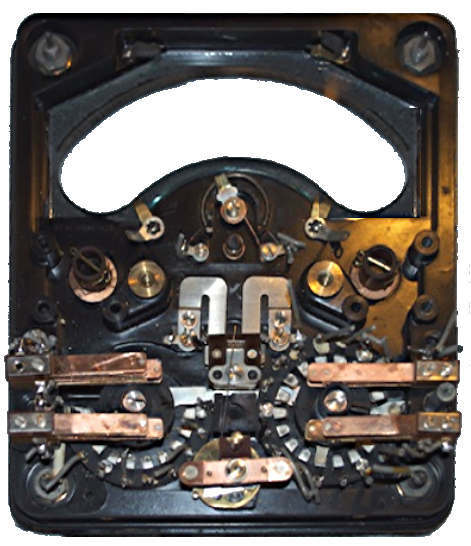 Introduced in 1951, the Braille model 7 meter was modified for use by visually-impaired servicemen and consisted of a more-or-less standard meter with a 'feeler mechanism' pointer over the scale, swung from the movement. You will note that the Braille range markers are on the front face of the meter rather than on the knobs. There are Braille markings moulded above the arc of the scale window for each of the ranges. The switch positions have similarly-marked Braille mouldings and a milled groove on each of the range selector switches so that the positions can be found by touch. 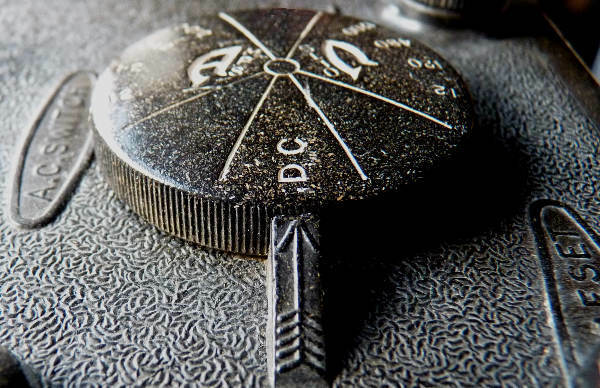 This idea was also implemented on the Model 8 which was introduced in 1951 though the model 7 and 40 meters continued to have engraved knobs until the end of production. The markings on the braille scale are said to allow users to interpret readings to within 1% of FSD. 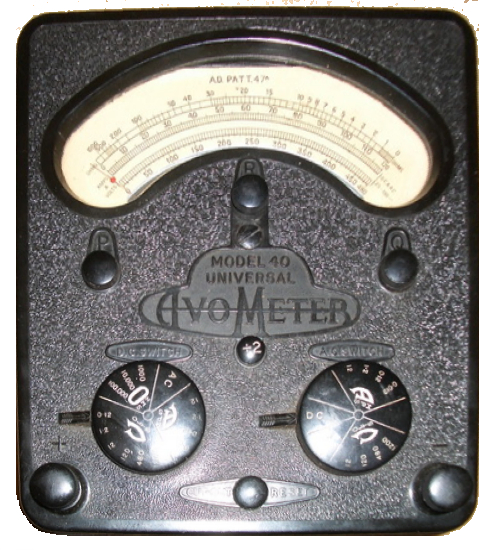 Universal Avometer model 40 re-done after Model 7: same as Model 7 except ranges and sensitivity. No dB scale. Until about 1948 meters would have had a horseshoe magnet such as this one. 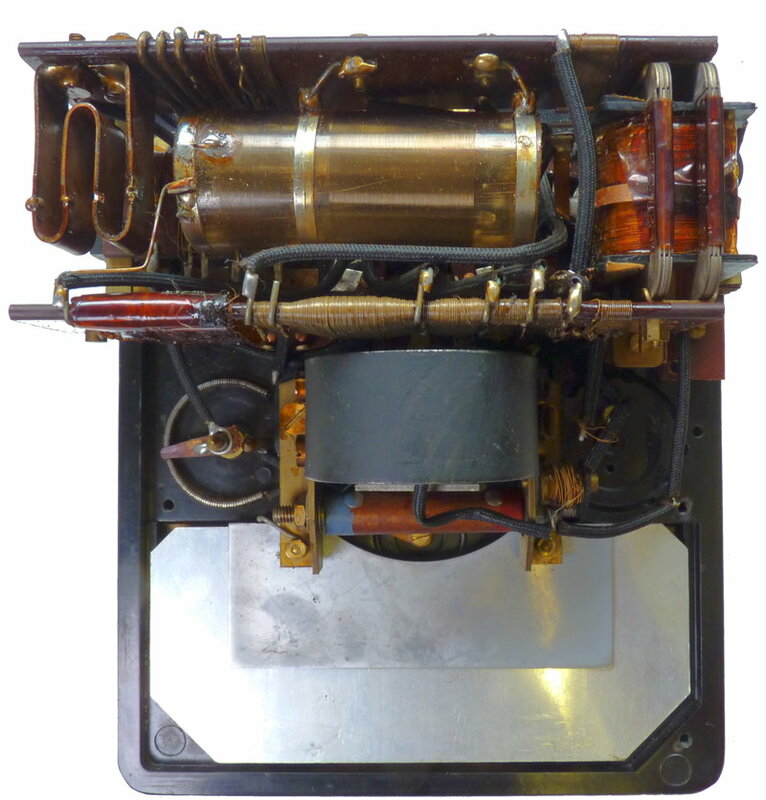 Several components including the rectifier have been replaced in this instrument. 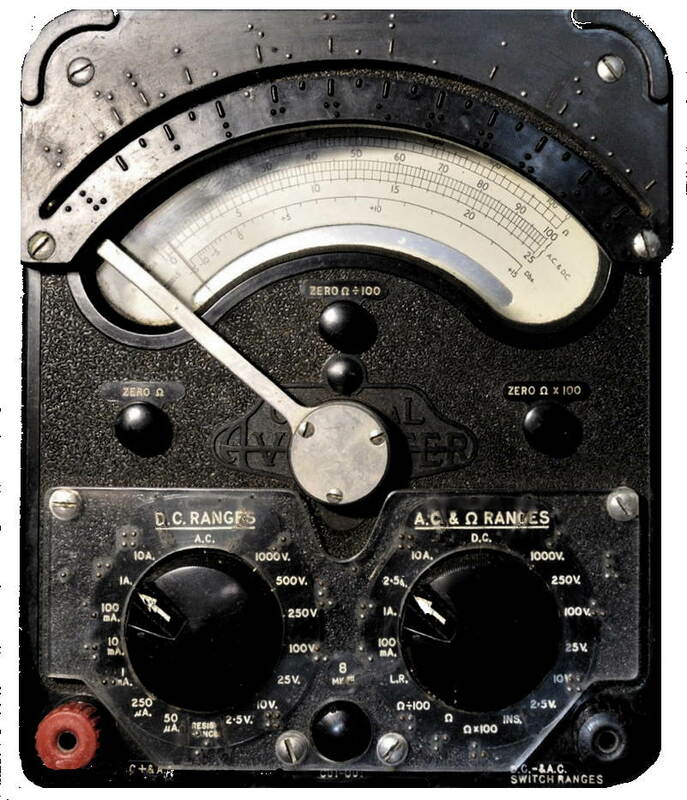 The scaling is similar to that on the model 5 Pre-War 36 range instrument which included a 480 volt AC voltage range, more suitable for power engineers who would want the facility to measure 3 phase mains voltages. Military version (Air Ministry). 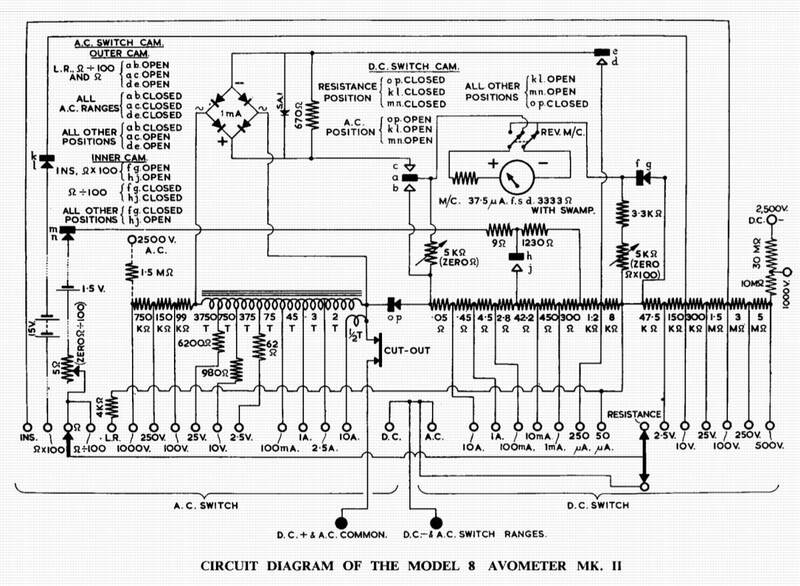 Modified Model 40; Switch instead of 'divide by 2' button. 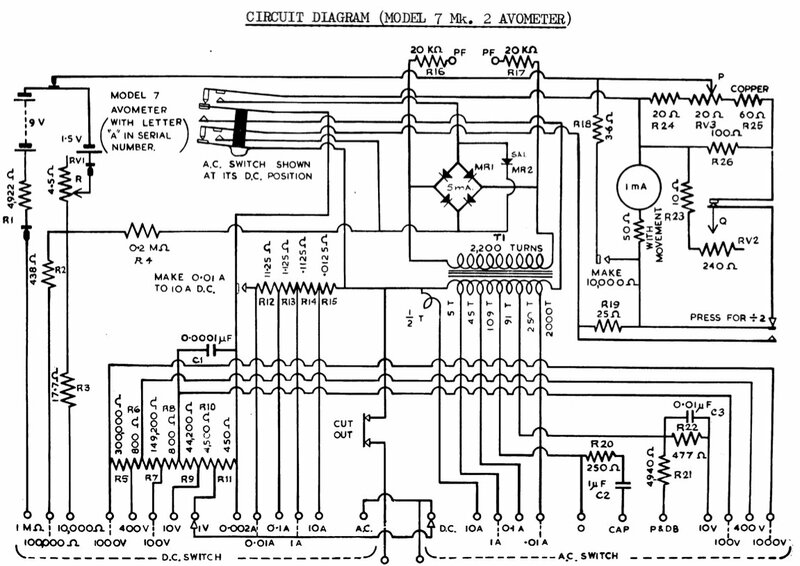 No Q potentiometer and only two resistance ranges. 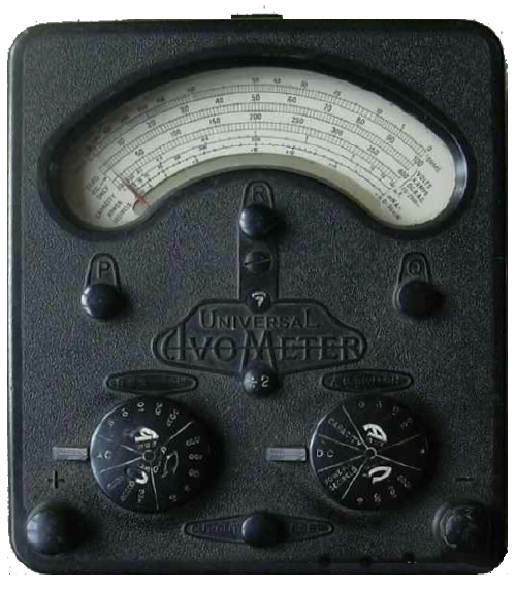 This meter only requires a single 1.5 Volt cell unlike the model 7 detailed above. 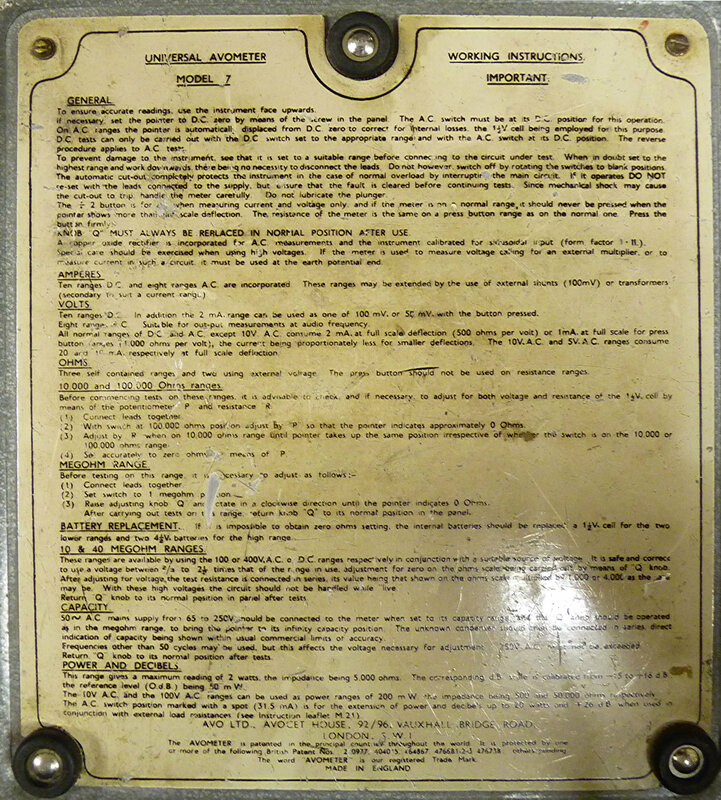 Universal Avometer Admiralty Pattern Model 47A. 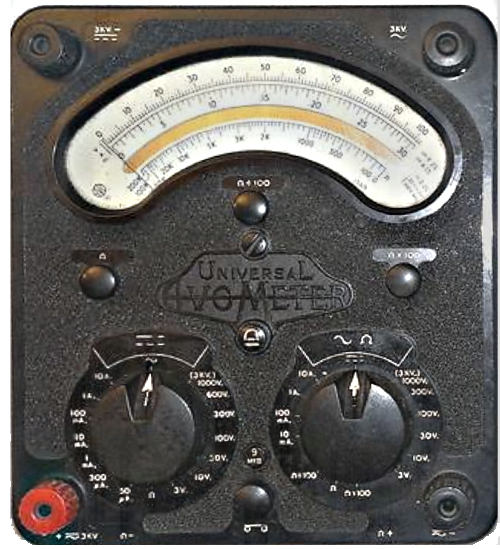 Note that on this model 40 the front panel moulding includes "MODEL 40 UNIVERSAL" rather than the more usual "UNIVERSAL" and that a sans serif font has been used. 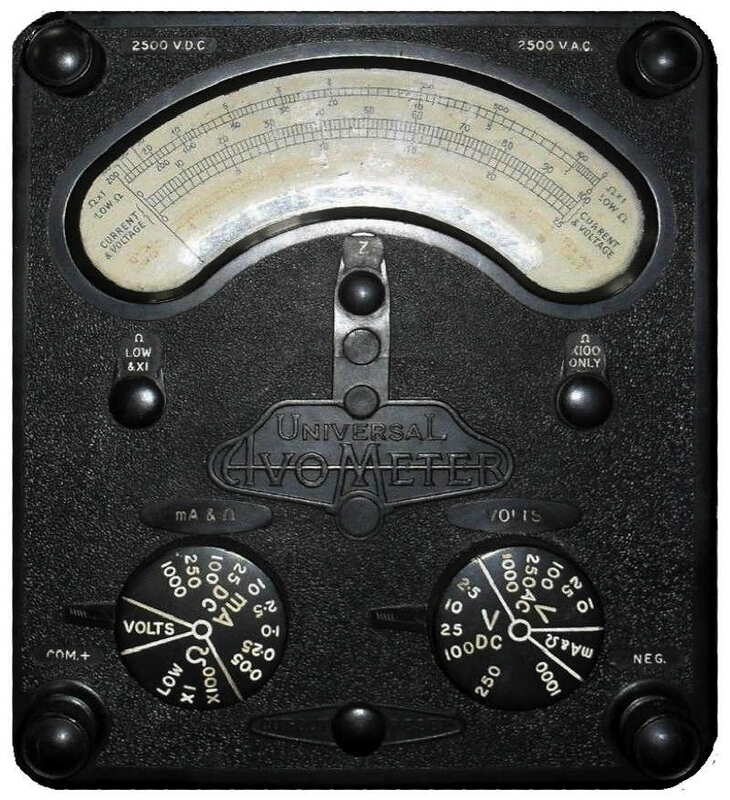 Universal Avometer Admiralty Pattern Model 48A. 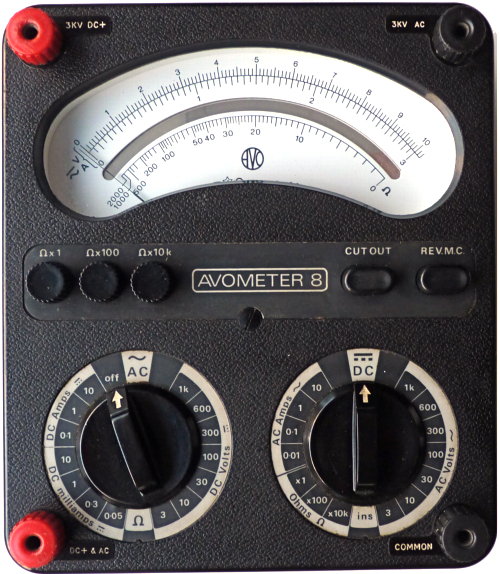 AVO Industrial Test Set incorporating a modified Model 40 multimeter. 4,800V Multiplier, 120A Shunt, 480A Shunt and 60/240A Transformer. 4,000V Multiplier, 100A Shunt, 400A Shunt and 50/200A Transformer. New movement design but no external changes initially. 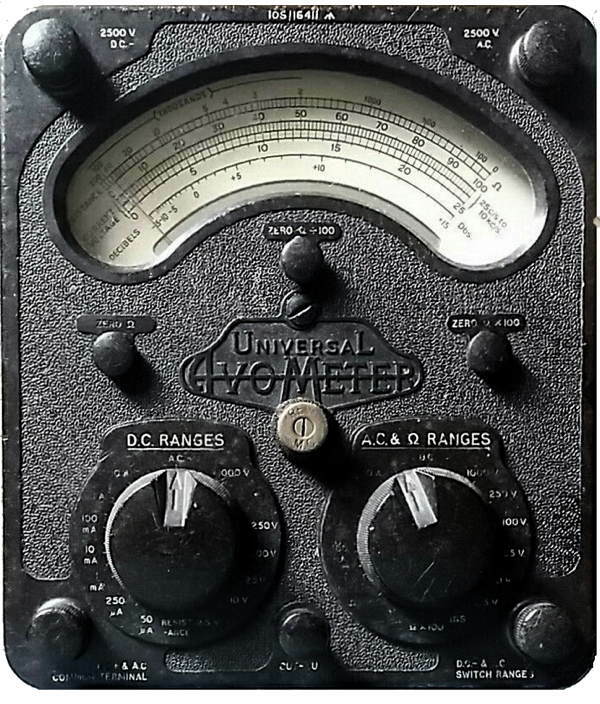 At some point during the early 1950's power factor jacks for P.F. 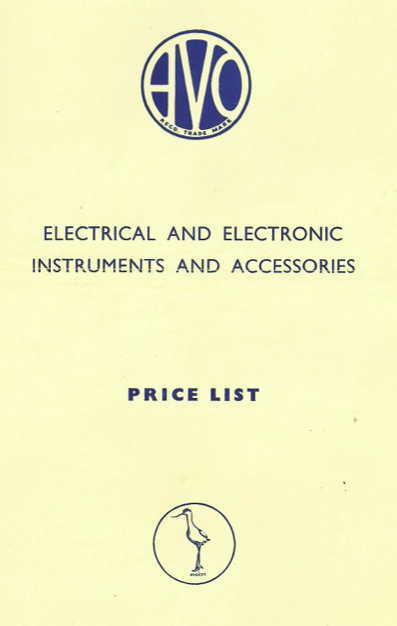 unit were added and the banana terminals in 1956. 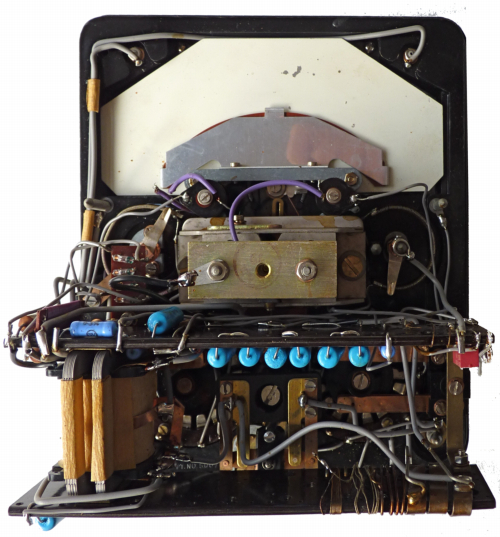 This instrument has a germanium rectifier, which must have been a later change. Last manufactured 1986. Housed in aluminium case. A self-contained multi-range A.C./D.C. 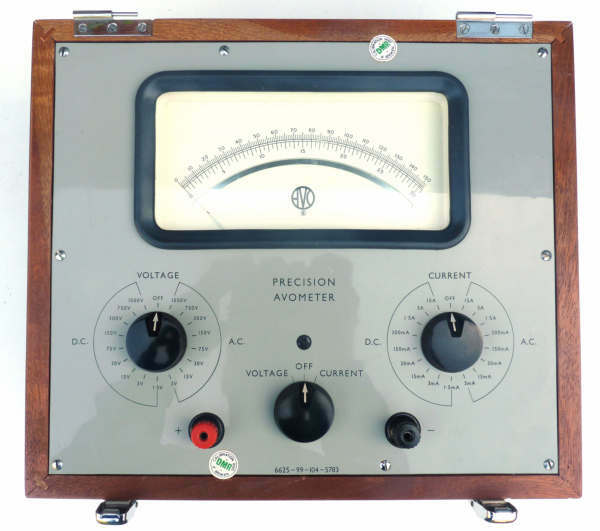 instrument providing 40 ranges of current, voltage and resistance. Higher ranges are obtainable with the aid of external shunts, transformers or multipliers. 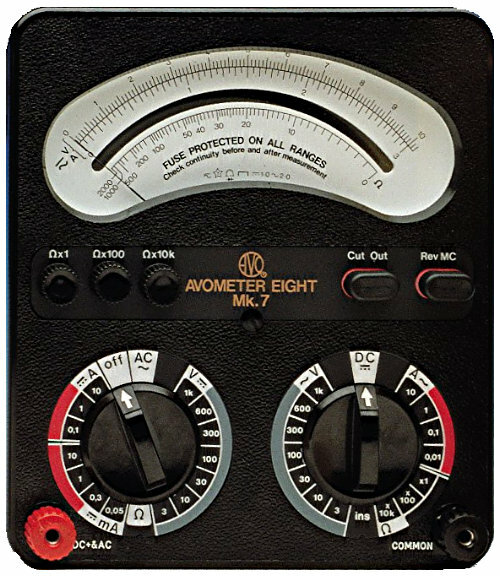 Range selection is accomplished by means of A.C. and D.C. switch knobs, and in addition a -:- 2 press button halves the value of any current or voltage range. Full scale deflection on voltage ranges is obtained with a consumption of 3mA. or 6mA. according to whether the press button is used or not. 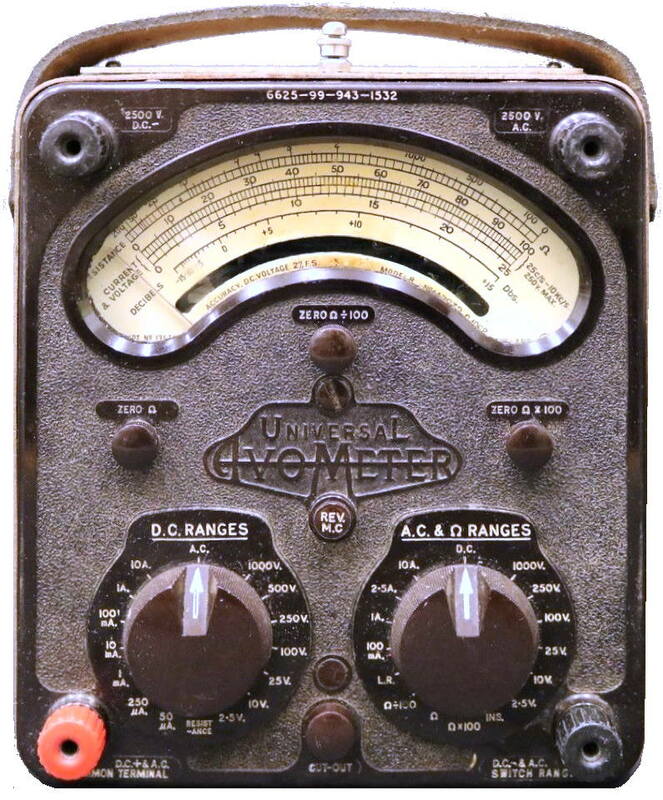 Total resistance of the meter is 200,000 ohms. 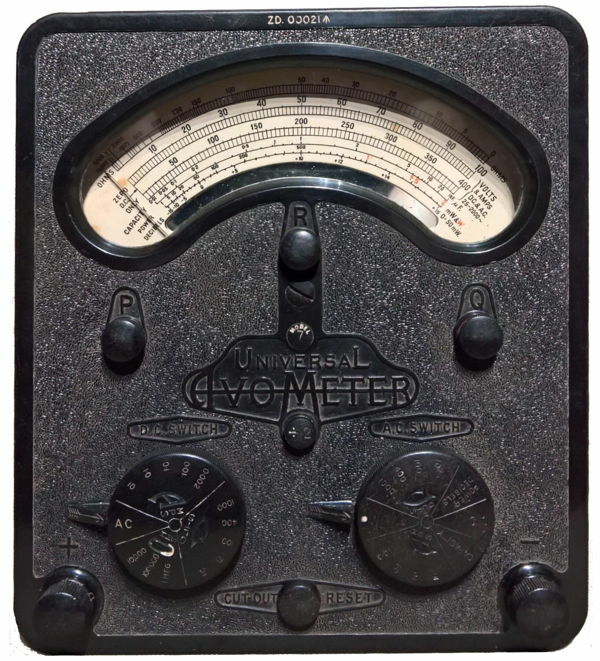 The instrument is similar in design and appearance to the Model 7 AvoMeter, and is fitted with an automatic overload cut-out. CURRENT: A.C. and D.C. 0 to 12 amps. VOLTAGE: A.C. and D.C. 0 to 1,200 volts. RESISTANCE: Up to I megohm. 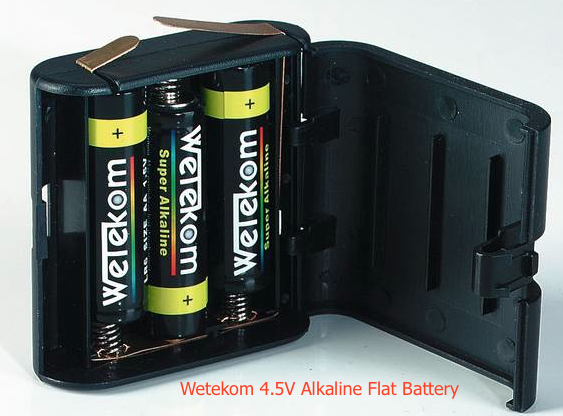 Battery compartment with cell carrier (see above) in position. Front panel mouldings for most models changed in the late 1940's, the knobs were deeper and the panel markings were white filled and incised rather than raised as previously. 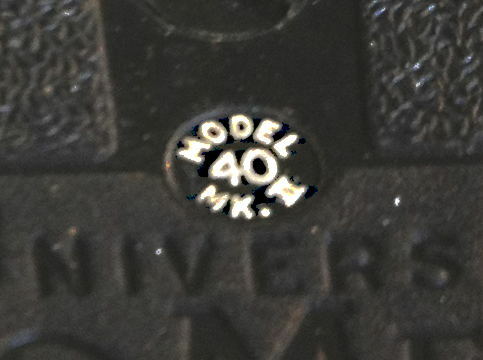 The same moulding was often used for the front panel and the model number and Mk was often but not always indicated as shown here. 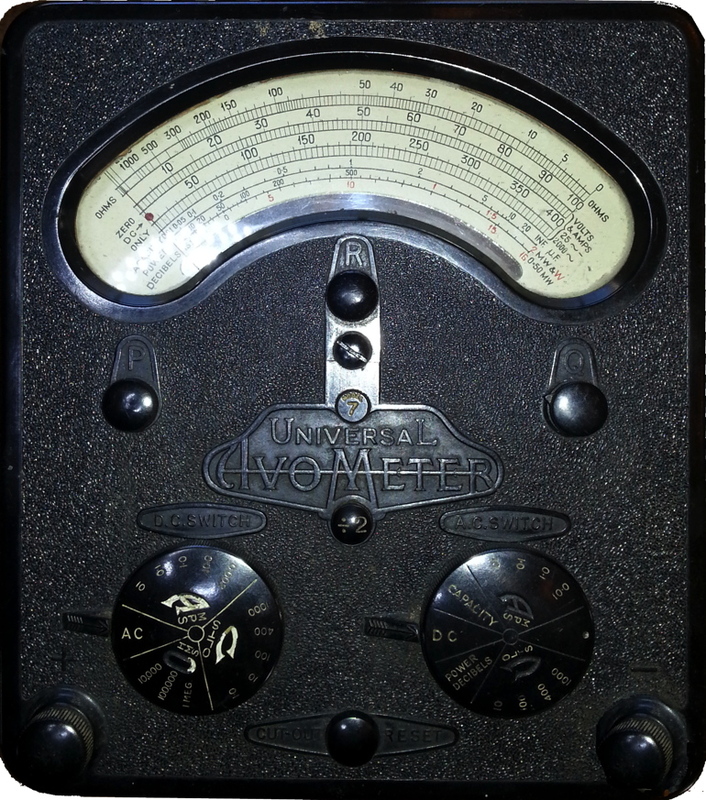 Note the diffferent ohms scale and buutton labels. 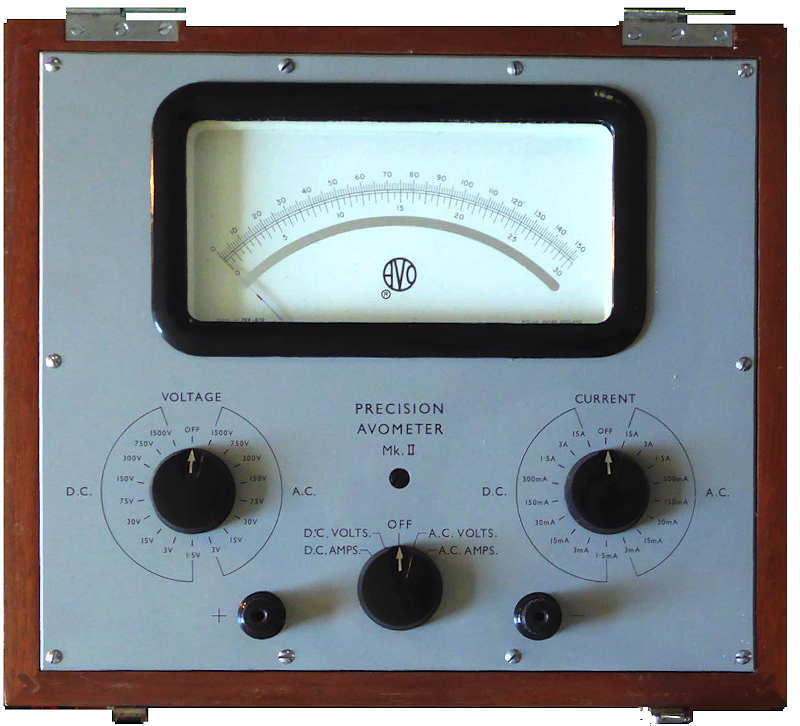 This instrument was available in two versions model 1 and model 2, the latter had an extended resistance range and could measure up to 20 M ohm. Instruments in screened cases were also available. 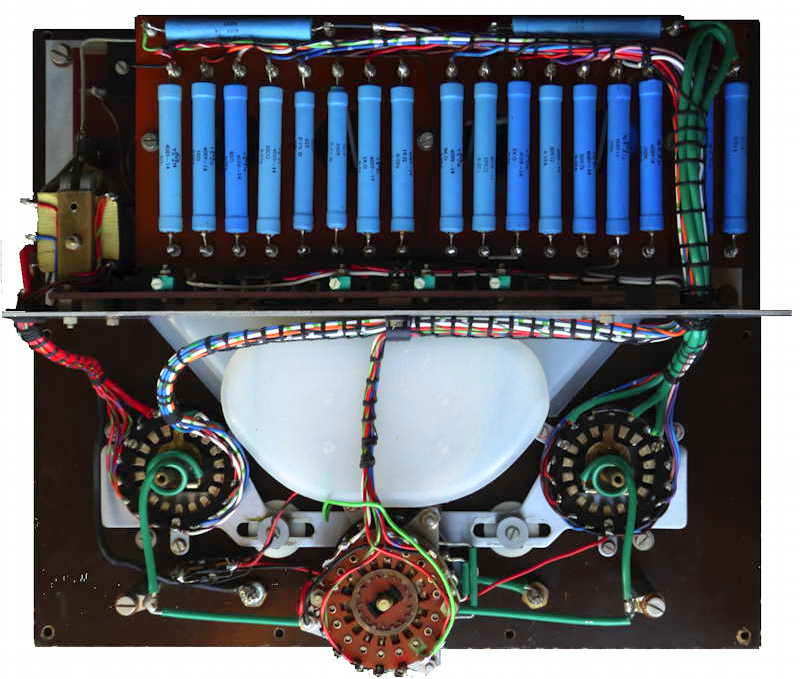 Development of High-Resistance model, added back transformer and normal switch design. Meter reverse button added. 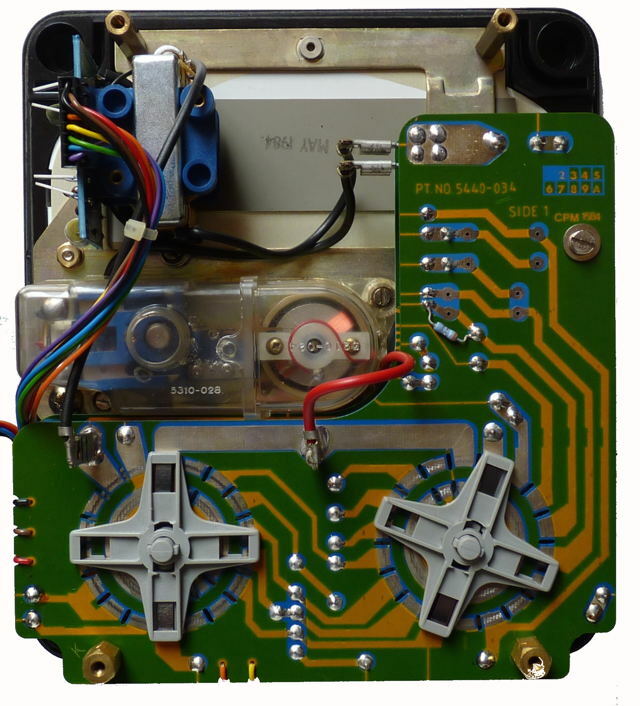 Interior re-design to incorporate commercially available variable resistors on resistance ranges. 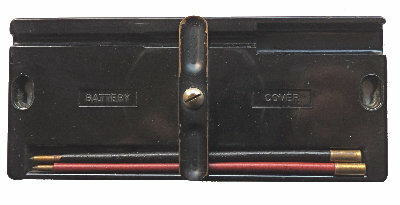 Bakelite case with battery cover designed to hold the test prods. The model 8 was designed to accommodate the more readily available cylindrical U2 cell (size D) and because of the higher resistance ranges a small 15 Volt battery. 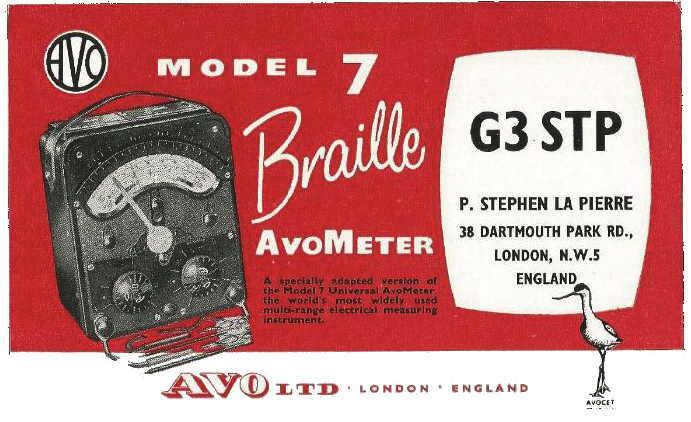 Early models of the AVO 8 use the B121. 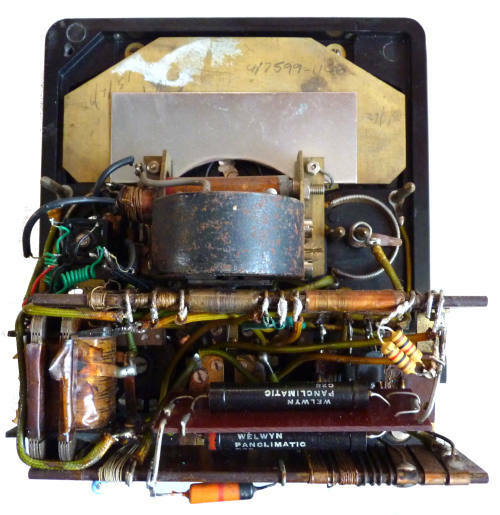 This battery was superseded by the B154 type (squarer cross section) and in 1970/71 AVO started issuing instruments with an adapter to accommodate the smaller dimensions. The B121 and B154 were made with ten biscuit type layer cells. 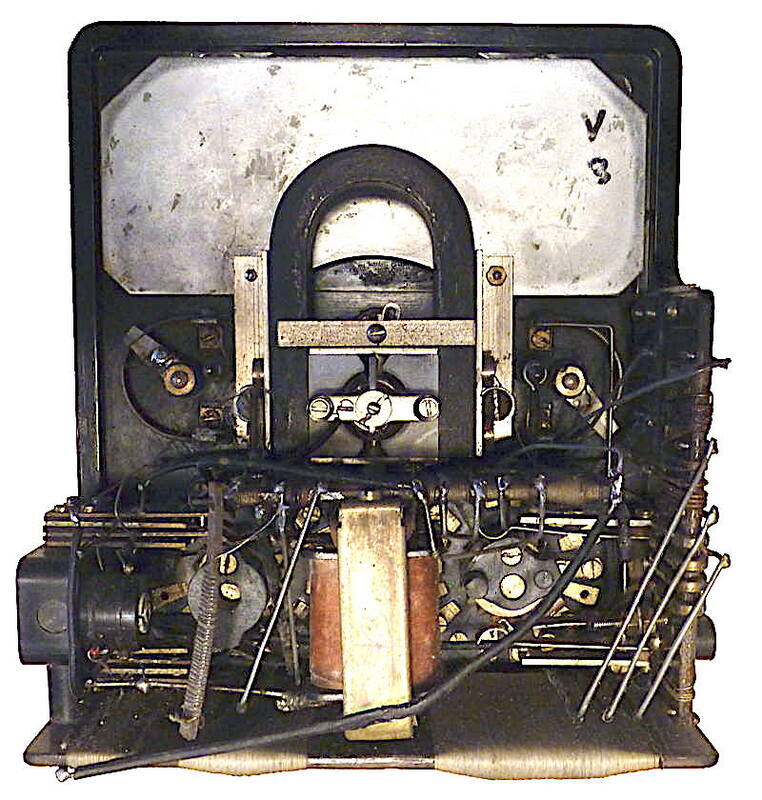 Modern equivalents are constructed from round button cells (hence the R in the type number). 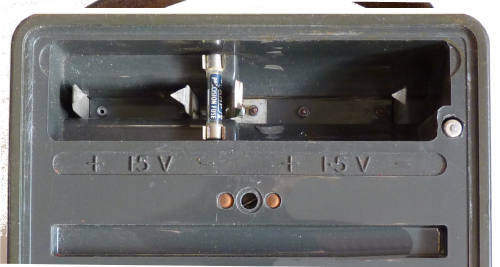 The meter battery contacts seem to have been changed in the late 1960's from the flat type shown here to pointed spring contacts more suitable for the BLR types. BLR121 Height: 36mm. Width: 15mm. Length: 26 mm. BLR154 Height: 34mm. Diam: 15mm. The BLR121 and BLR154 are both rated at 40mAh. These can still be obtained but prove to be very expensive. I have successfully refilled the plastic casing with ten new cells obtained from a "Pound Shop"
The steel clip shown here is used to keep the 1.5Volt cell in place. Insert 1.5V cell with positive towards the centre, the red dot indicates how the 15V one should be inserted. 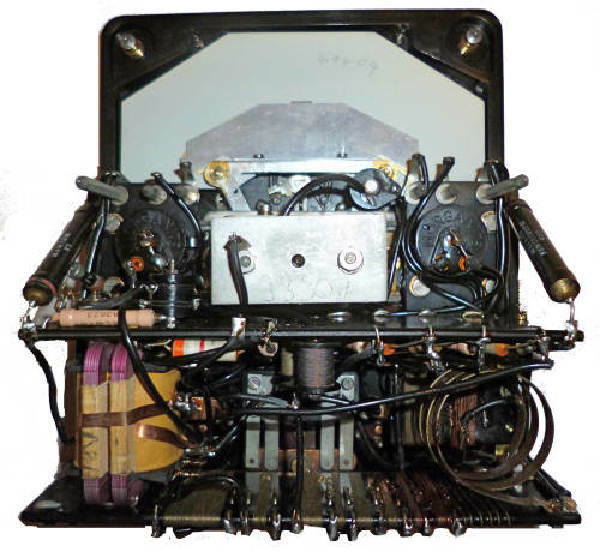 Note that this cover unlike the one for the Model 7 has an additional slot for a spring loaded hook probe which is often missing. 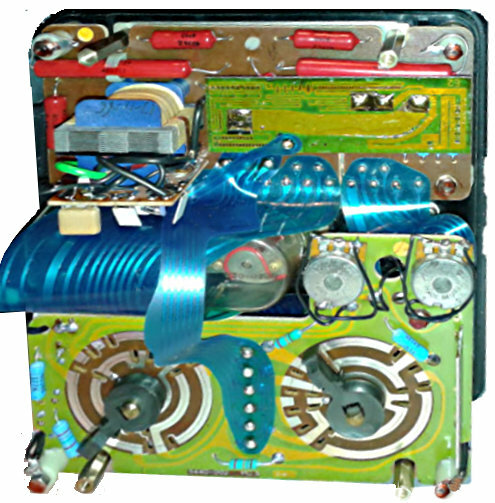 This one is the same as the model 8 Mk1 except that it is fitted with an extended metal push button with rubber boot to reverse the moving coil. This type of pushbutton was used on some miitary versions but not all and some if not all have a steel outer casing with an earthing terminal. 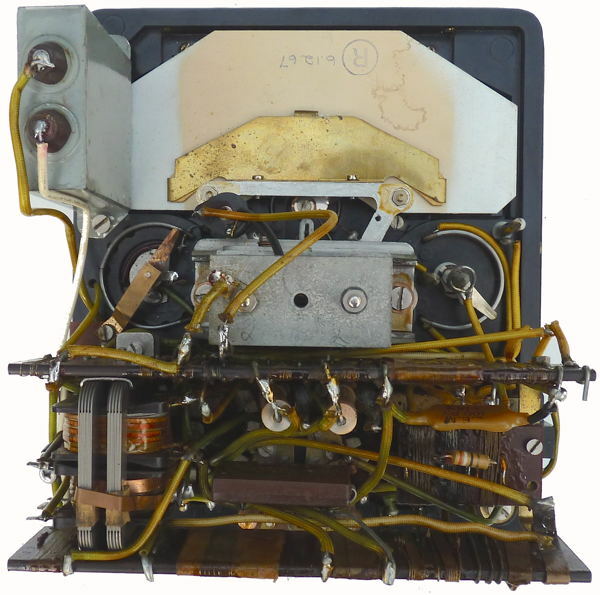 Later versions of the model 8 with this tyoe of push button were being made and labelled with 10S/16499 in the late 1960s. Added red and black banana terminals. Added 500 volt DC range early in production. 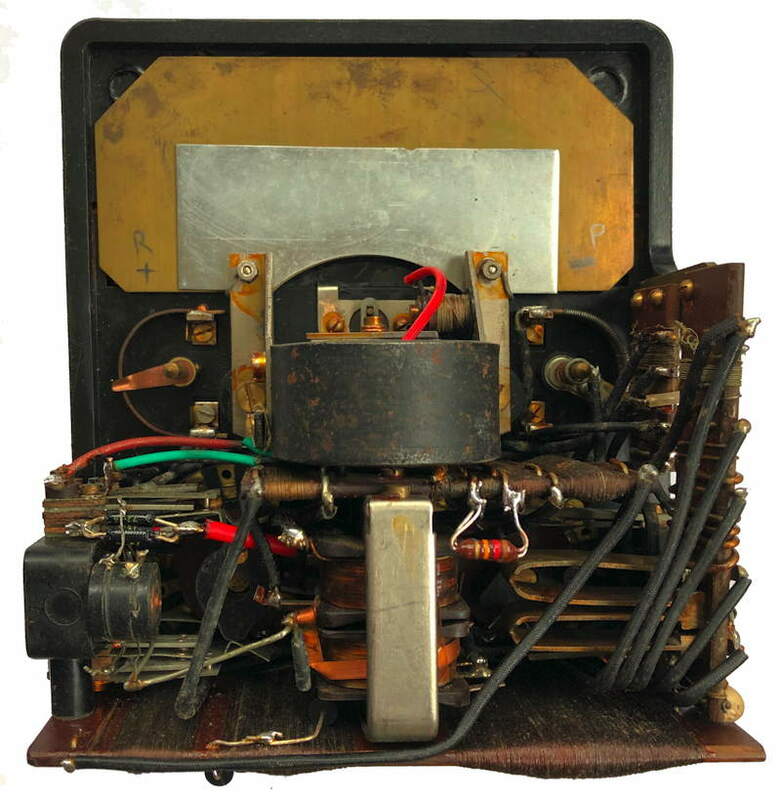 The rectifier has been replaced in this instrument. 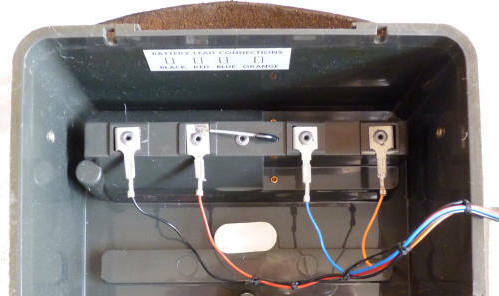 With the change to the familiar red and black terminals new leads and prods were made and the battery cover was a simple piece of metal with two keyholes and a piece of expanded rubber to keep the 1.5 Volt cell in place. 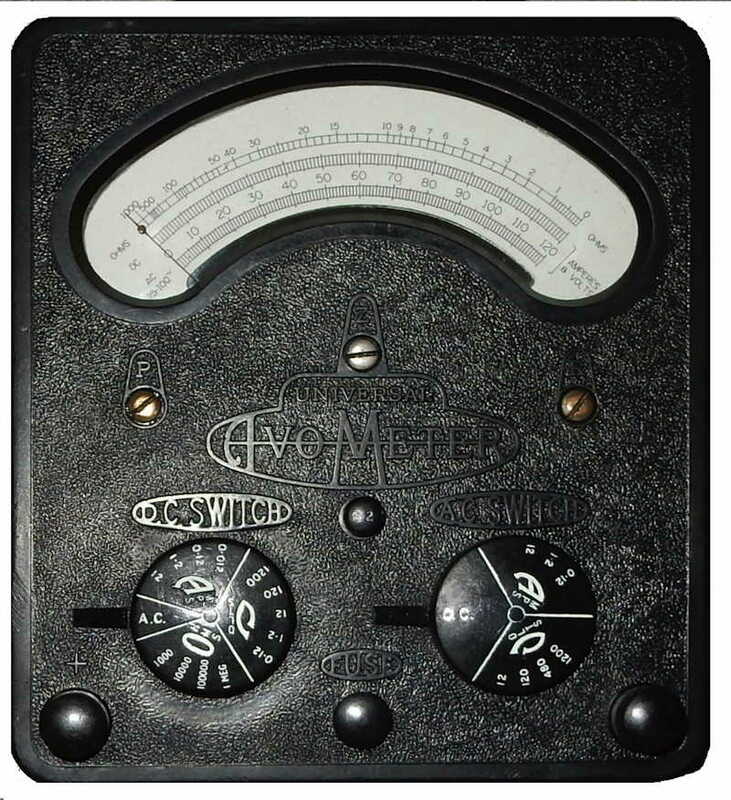 This instrument has been produced in response to a demand for a high sensitivity version of the world-famous Model 7 AvoMeter. It follows the standard design, retaining the traditional simplicity of operation and compact portability. It has a sensitivity of 20,000 ohms per volt on all D.C. ranges and 1,000 ohms per volt on A.C. ranges from 100 V upwards. 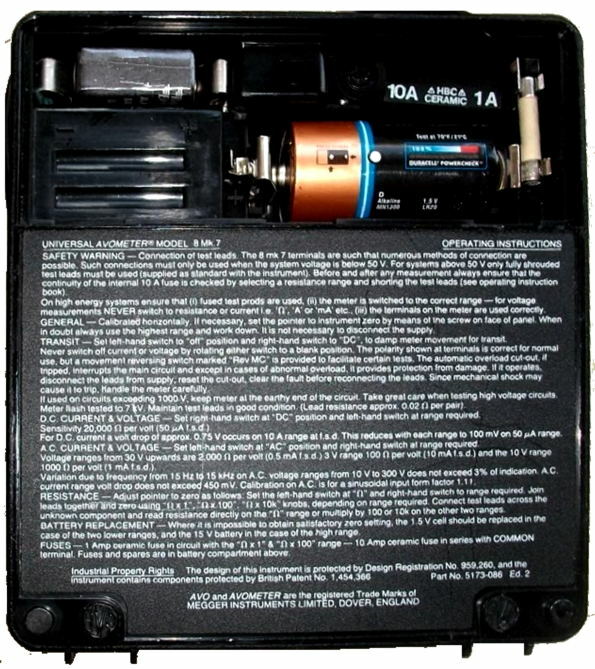 In addition to the many well-known features such as the automatic overload protection device, dual-knob range selection, etc., it has a push-button for reversing the polarity of the movement to obviate the inconvenience of changing over the leads when encountering opposite potentials in respect to a common reference point. VOLTAGE: A.C. and D.C. 0 to 2,500 volts. RESISTANCE: 0 to 20 megohms (with internal batteries);,O to 200 megohms (with external D.C. supply). DECIBELS: -15 db to + 15 dB. 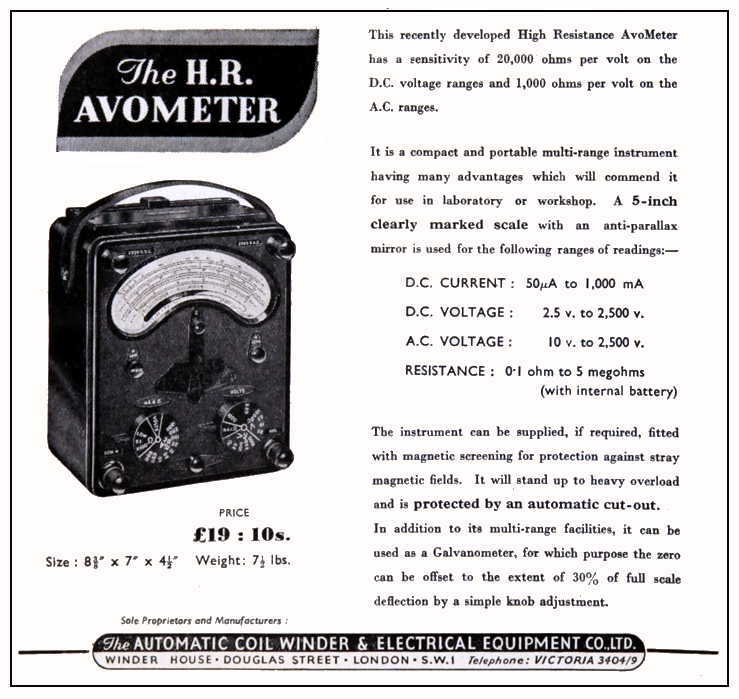 Where applicable, all AvoMeters and AvoMinors meet the standards of accuracy laid down in Section 6 of British Standard Specification 89/1954. Shrouded plug in type leads are now supplied with all AvoMeters. 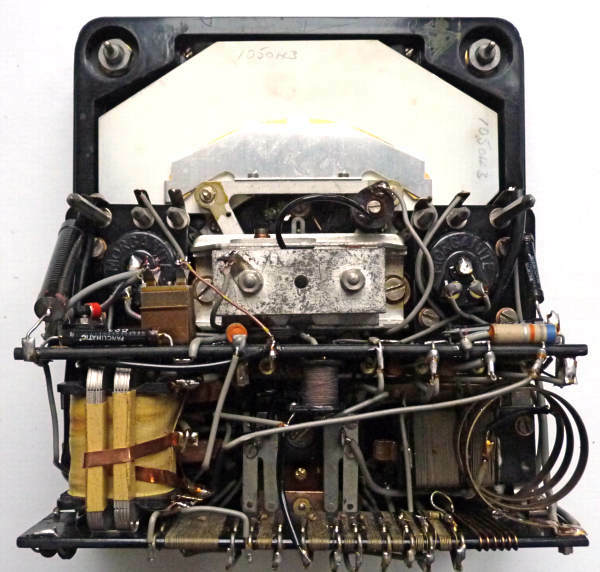 This is the inside of a model 8 Mk2 showing the four inner leaf springs which make connections between the battery compartment and the meter movement and the two outer ones which make connections to the HV terminals. 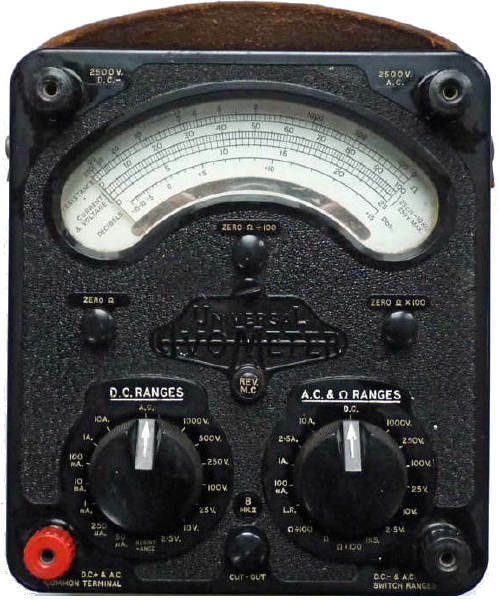 A similar arrangement is used on the model 7 and model 40 meters. A panclimatic version of the model 8 was introduced in the early 1960s. 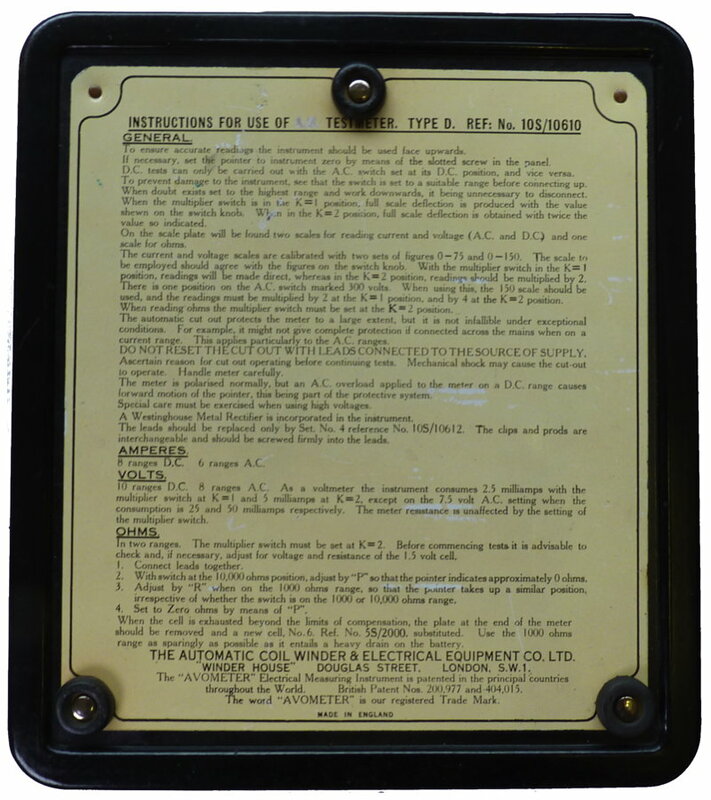 Electrically and mechanically the same as the model 8 it was a tropicalised version incorporating encapsulated components and using materials resistant to mould growth. Under bright light as can be seen on the image here the moulding material for the casing and knobs has a brownish tinge. 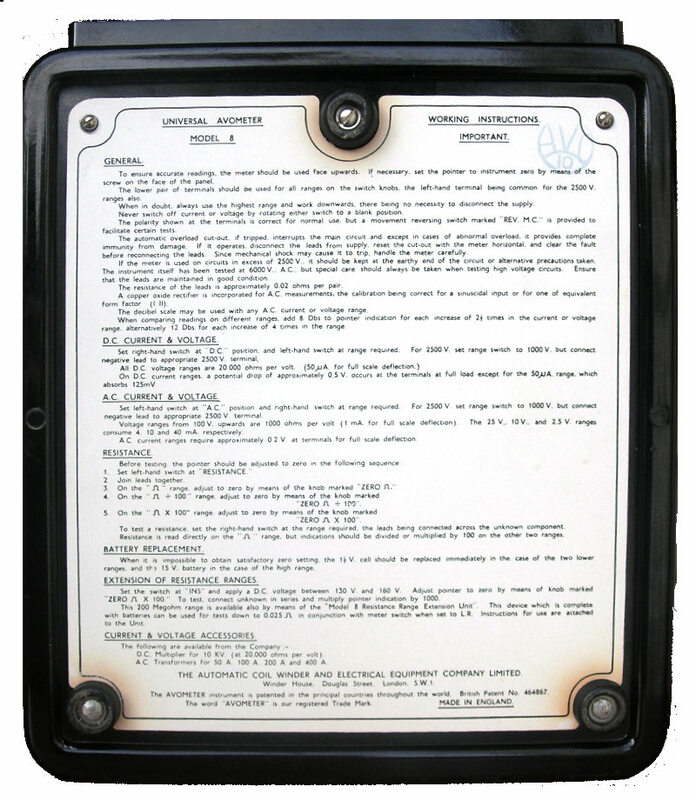 The model 8X was also supplied in a steel screening case referred to as the model 8SX. 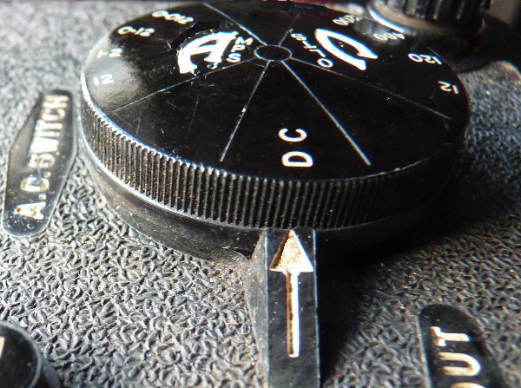 The model 9 was intended for the export market and is similar to the Model 8 MarkII apart from the international symbols and 3-10 ranges instead of 2.5-10 and the positioning of the anti parallax mirror. 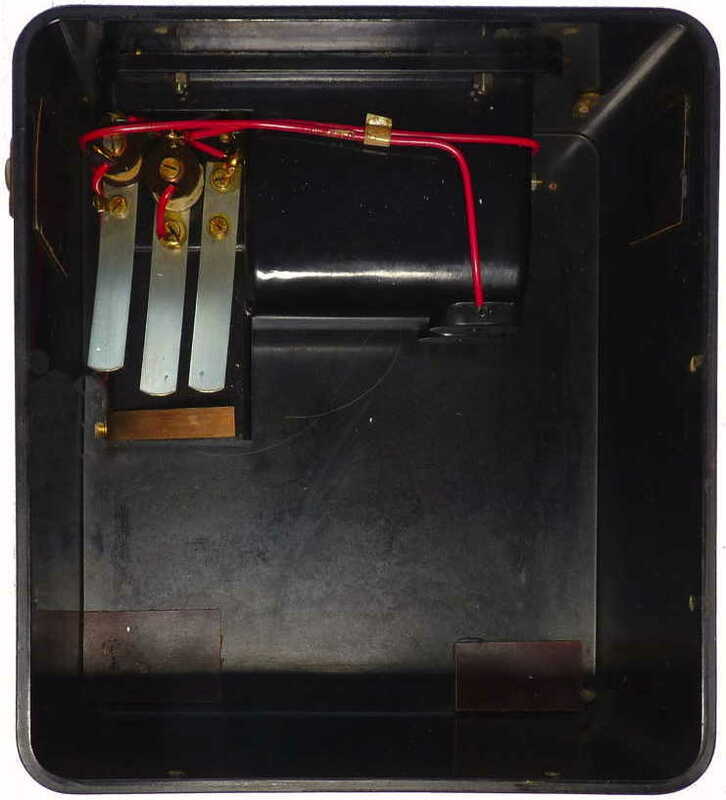 Battery compartment found on Model 8 Mk2 and 9 Mk2 instruments. Insert 1.5V cell with positive towards the centre, the red dot indicates how the 15V one should be inserted. 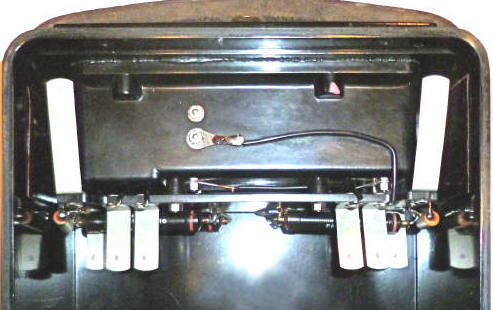 The Bakelite cover was changed to a simple metal part with keyholes on the Mk2 and Mk3 instruments (see below). 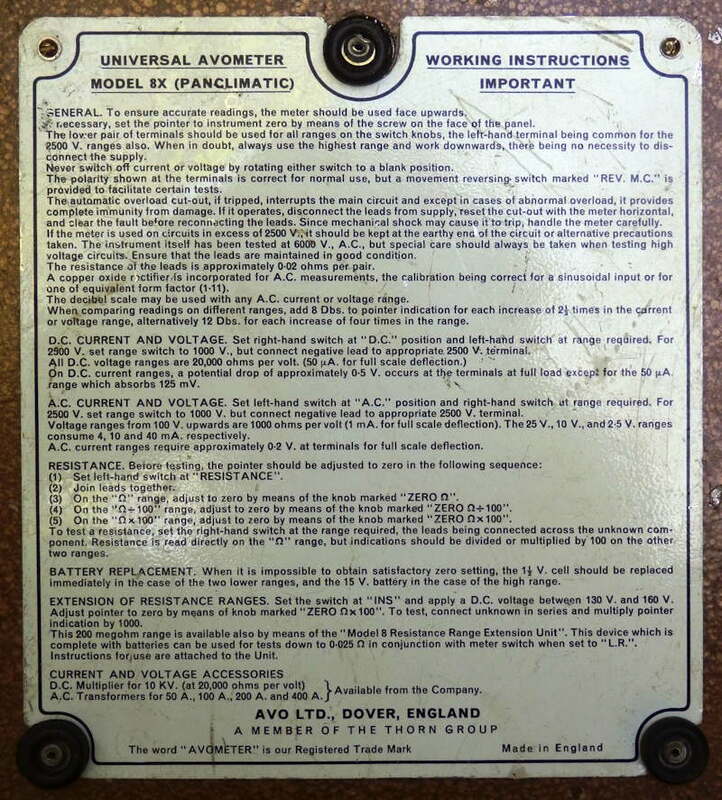 Note that Test set No1 was made for several years and was based upon the current commercial model at the time. 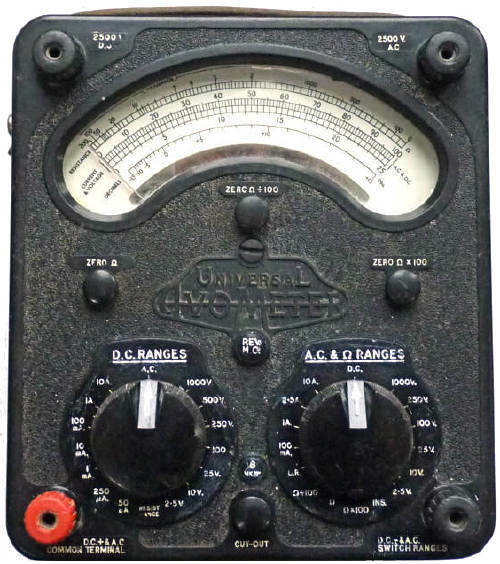 Test set No.1 (a military version of Model 8/9 Mark 2) Essentially the same as Model 8 Mark 2 apart from 3-10 ranges instead of 2.5-10; no dB scale; resistance on bottom of scale plate instead of top; no LR or Ins. positions. At some point added fuse on low ohms ranges. This model is housed in a protective steel case. and Mk 6 (from 1986 to end of Avo use). Battery Compartment. You can see that one fuse is a spare and unconnected. The negative contact of mine is a bit green and you will see that I have split open the case of the original battery to refill with new button cells. Replaced copper-oxide with germanium rectifiers to improve AC sensitivity and frequency response (typically 20K Hz at 2.5V). 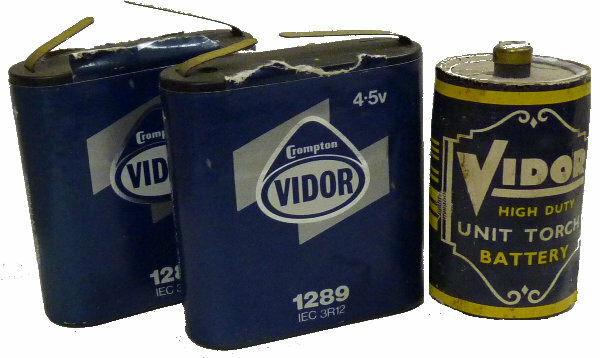 These were not incorporated in Model 9 until the Mark 4 version. Fuse added to low ohms ranges. 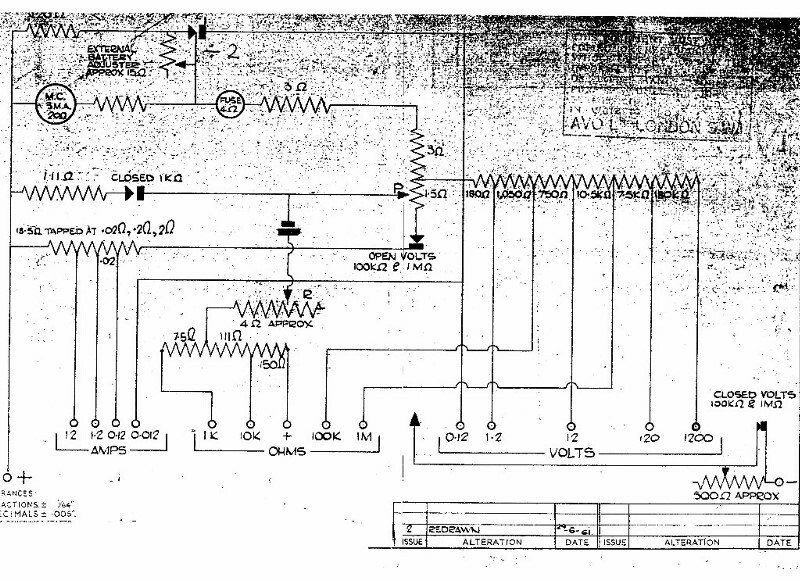 Early models of the Mk3 do not incorporate the additional protection features described below and shown on the circuit diagram. 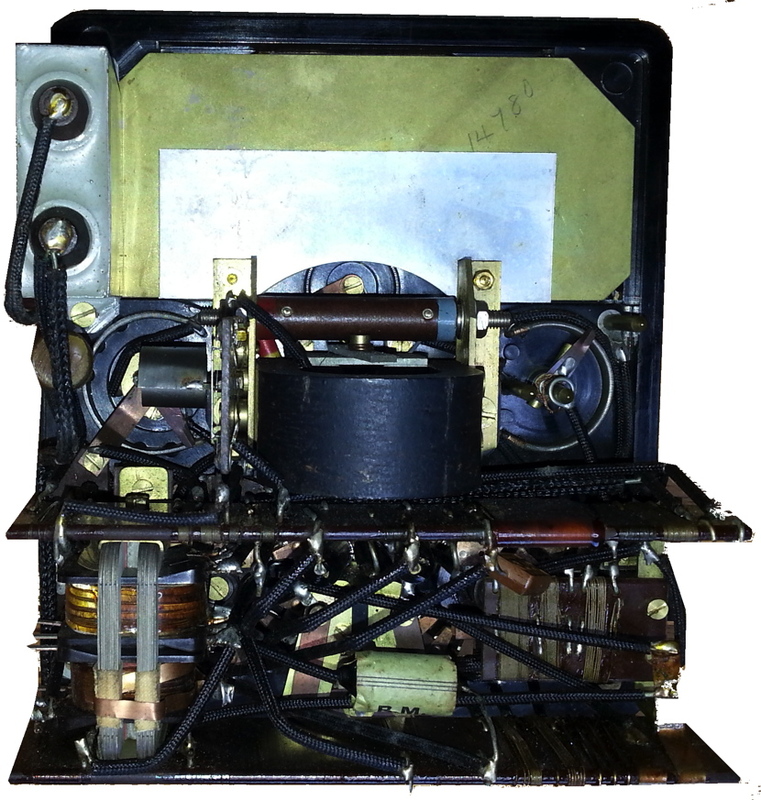 A miltary version of the 8Mk 3 (AM stores number 10S/16411) with extended Rev MC button was also made like that shown on the earlier model above. 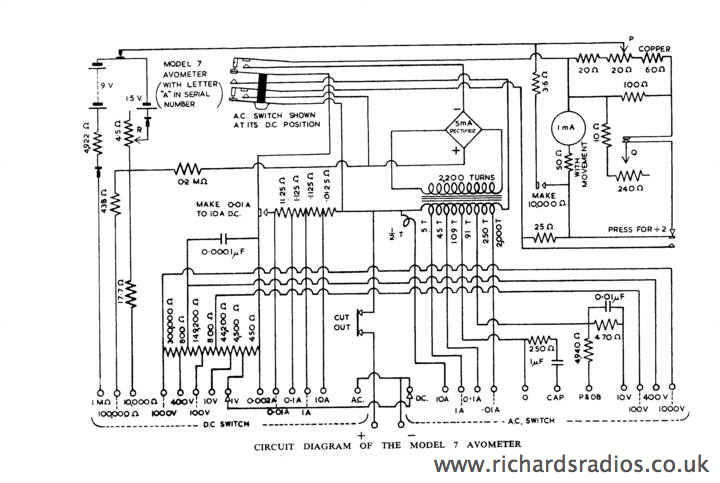 Looking at the diagram on the right the meter has thermal compensation plus additional protection diodes around the movement and in circuit with the ohms range. 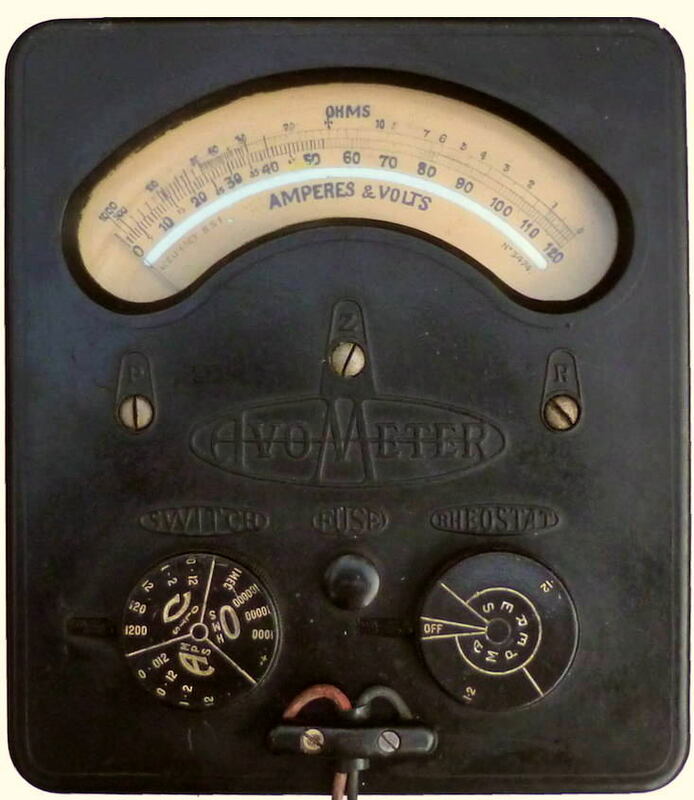 The ohms range was vulnerable to putting it across AC so the diodes back to back would protect the meter and draw the current through the fuse. Also a diode across the movement deals with AC on a DC setting so protects the movement, so it sees 1/2 the waveform thus tripping the mechanical movement otherwise the movement would just see AC and not move therefore not cut out and ultimately be destroyed. Previous models it seems would not be protected if on the DC setting but were connected to a high AC supply voltage. Note the changes to the battery contacts and the shaped rubber spacer to keep the 1.5 Volt battery in place to one side to make room for the 1Amp fuse and spare. 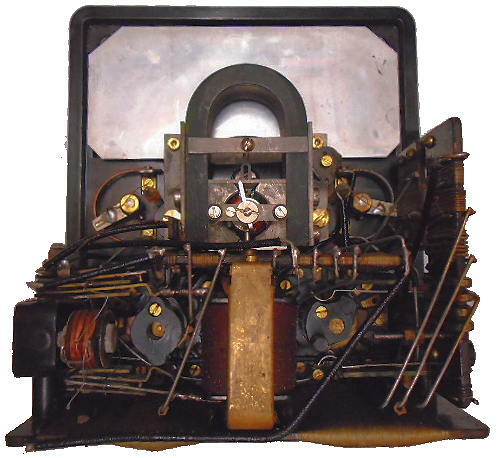 This is a later and more sensitive version of the Braille model7 shown above. Housed in plastic case. Mirror placed mid scale rather than at bottom as on all previous versions. This was the last model to have leather rather than plastic carrying strap. This multi-range instrument has been designed to meet the requirements of radio, television and electronic engineers requiring an accurate, sensitive yet robust instrument. 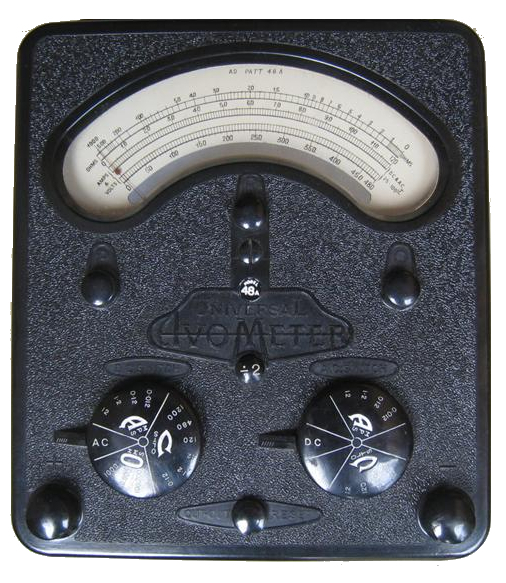 The Avometer Model 8 Mk 4 incorporates all the traditional design features of its predecessors, so highly valued for Simplicity, together with such additional features as: increased sensitivity in the lower a.c. voltage ranges, fused ohms circuit to provide increased protection against inadvertent overload in the lower resistance ranges, improved temperature coefficient enabling measurements up to 500 amps d.c. to be made with the aid of a range of shunts, and improved frequency response. 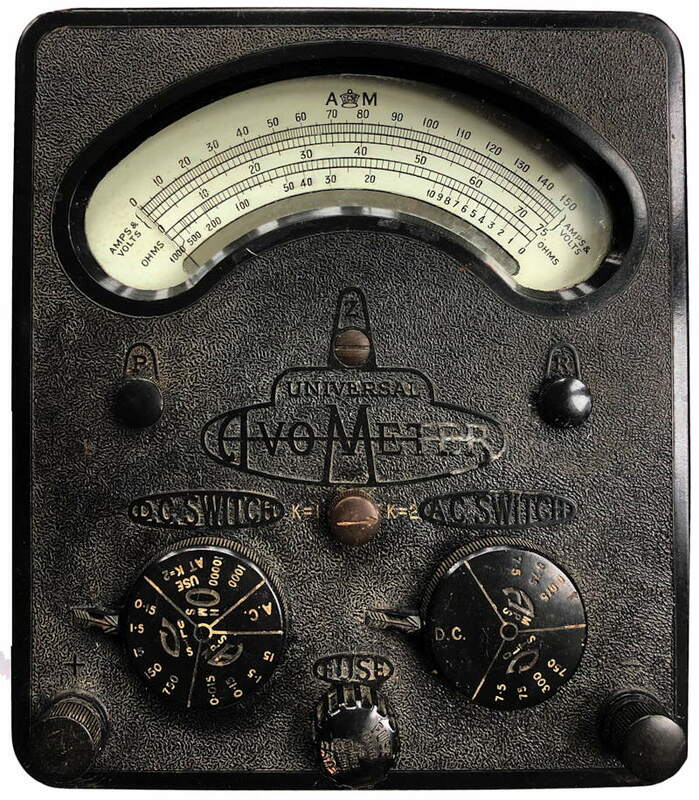 It also incorporates the familiar Avo automatic cut-out mechanism and a decibel scale for audio frequency tests. AC 10mA to 10A f.s.d. in 4 ranges. DC 50uA to 10A f.s.d. in 7 ranges. AC 2.5V to 2,500V f.s.d. in 7 ranges. DC 2.5V to 2,500V f.s.d. in 8 ranges. Resistance: 0 to 20M ohm(First indication 0.5ohm). Decibels: -15dB to + 15dB. 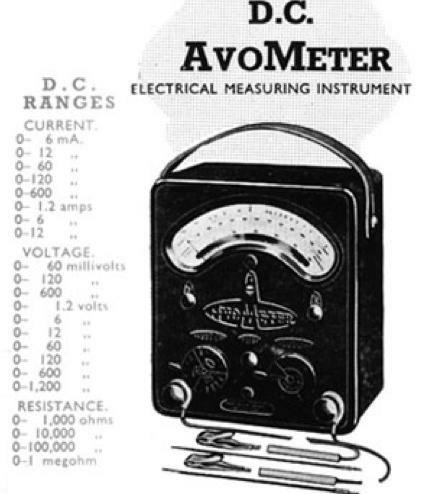 Accuracy: AC Voltage and Current ±2.25% of f.s.d. DC Voltage ±2% of indication. d.c. Current ±1% off.s.d. Sensitivity: AC voltage ranges 2,000 ohms/V(10V upwards). DC voltage ranges 20,000ohms/V (all ranges). Size: 204 x 185 x 115 mm. Weight: 2.95 kg. (including leads). 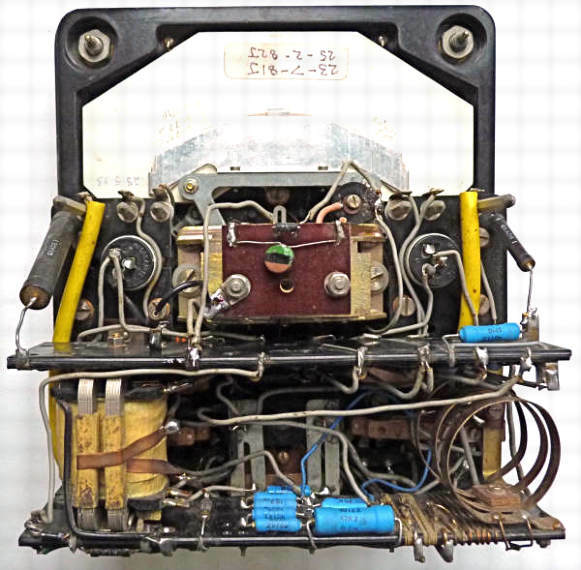 This is the first model to have wired connection between the battery compartment and the meter. The spare fuse is housed in a hole on the right. Access by removing the back cover. 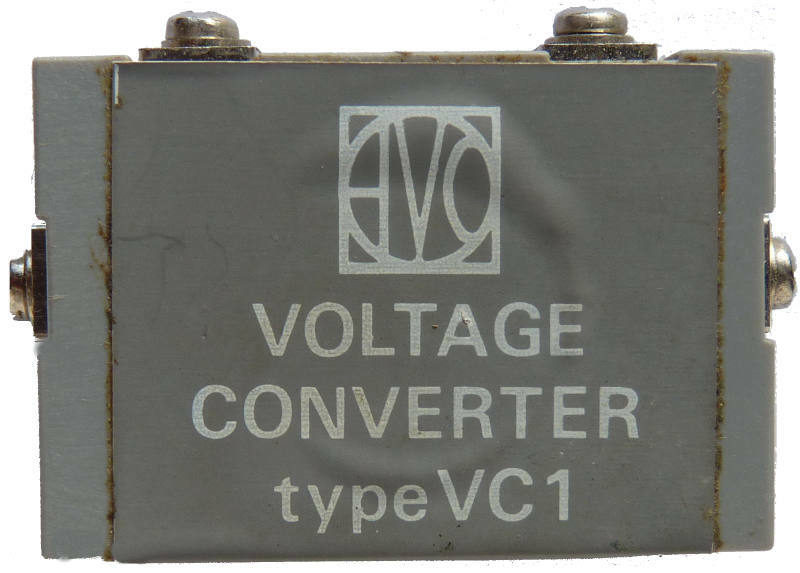 voltage converter which was supplied from the 1.5Volt cell. 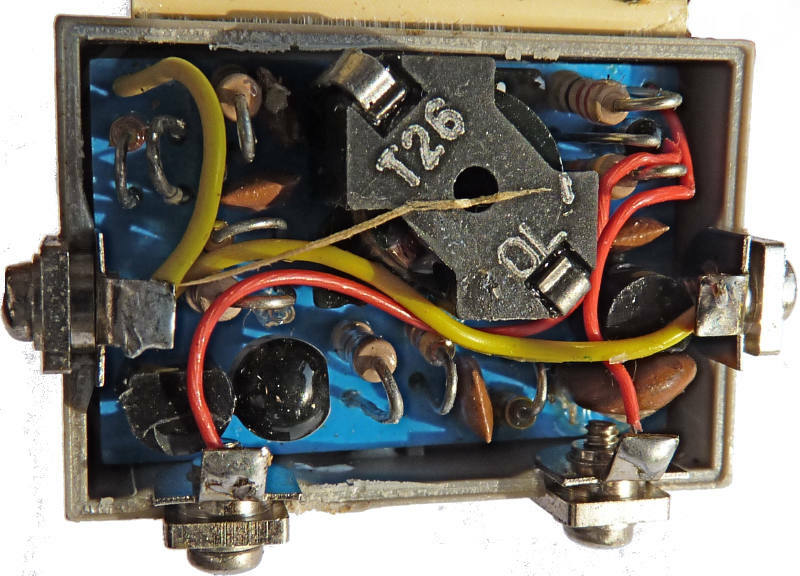 This item is normally supplied with a flexible printed connector though in my case the previous owner had soldered wires to the 1.5 Volt cell to power the unit. See here for more information. 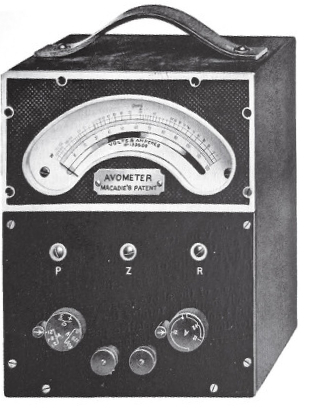 The Avometer Model 9 Mk. 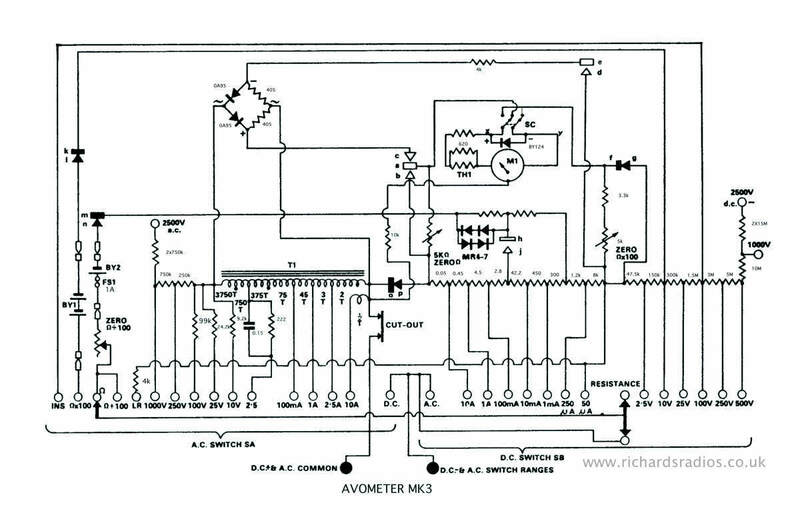 4 is a high sensitivity instrument for the measurement of voltage, current and resistance. 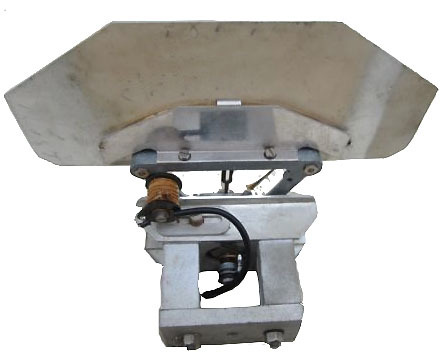 It is designed primarily for the electronics engineer and is similar in specification to the Avometer Model 8 Mk. 4. 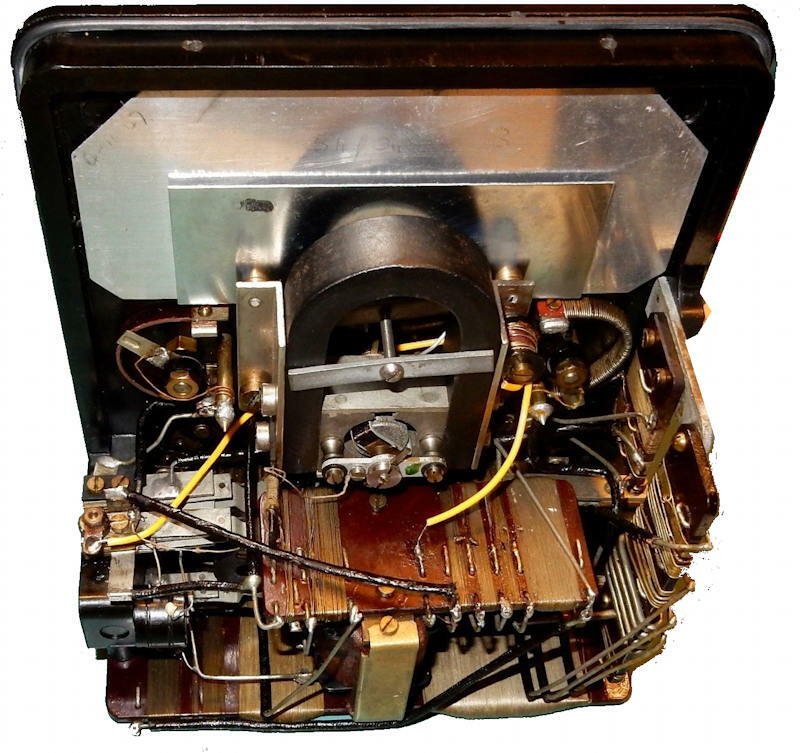 The Model 9 incorporates all the traditional design features of the Model 8 including the Avo automatic cut-out mechanism and reverse moving coil facility. 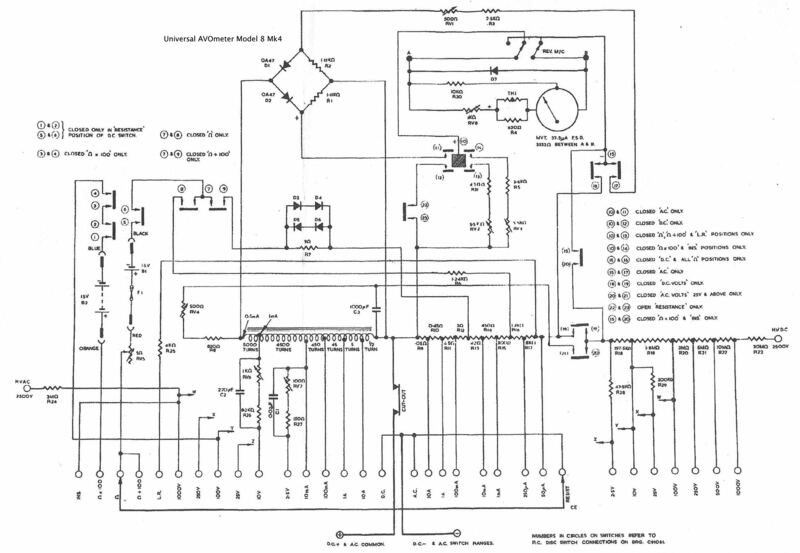 The Model 9 is, however, scaled in basic units of 10 and 3 and all range switches, controls and terminals are identified by graphical symbols, which in general follow the requirements of the International Electrotechnical Commission. The protective devices incorporated in the Model 8 Mk. 4 are all retained and an insulation resistance range now enables measurements up to 600A to be made using a range of external shunts. 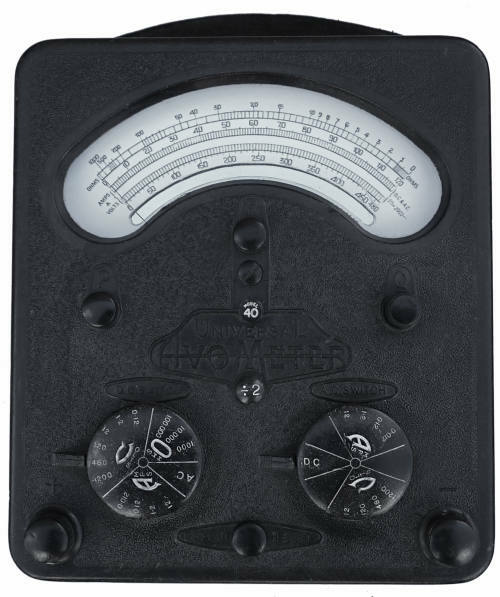 The decibel scale is, however, not included on this instrument. A.C. 10mA to 10A f.s.d. in 4 ranges. D.C, 50uA to 10A f.s.d. in 7 ranges. A.C. 3V to 3000V f.s.d. in 7 ranges. D.C. 3V to 3000V f.s.d. in 8 ranges. Accuracy: A.C. Voltage and Current ±2.25% of f.s.d. D.C. Voltage ±2% of indication. D.C. Current ±1% of f.s.d. 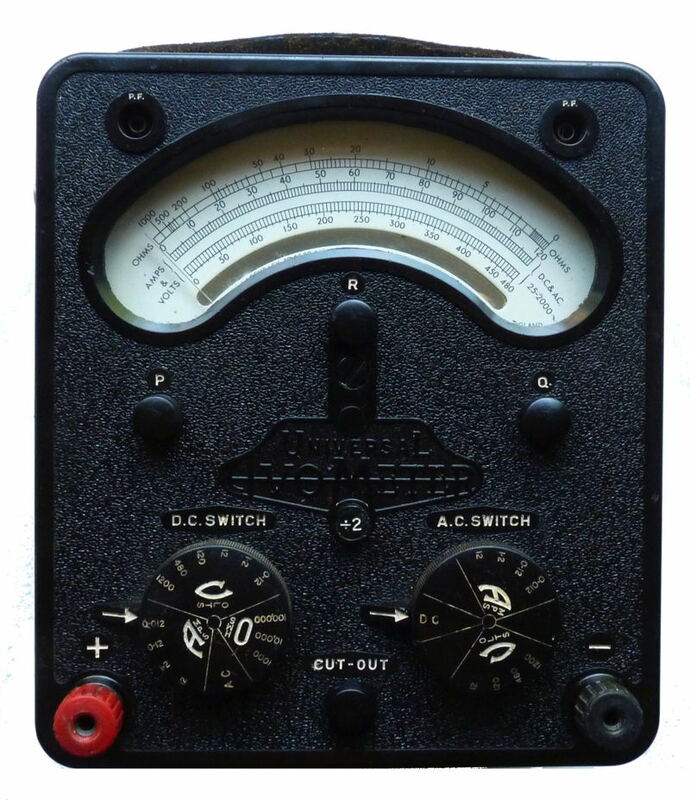 Sensitivity: A.C. Voltage Ranges 2000 ohms/volt (10V upwards). D.C. Voltage Ranges 20,000 ohms/volt (all ranges). Size: 204 x 185 x 115mm. 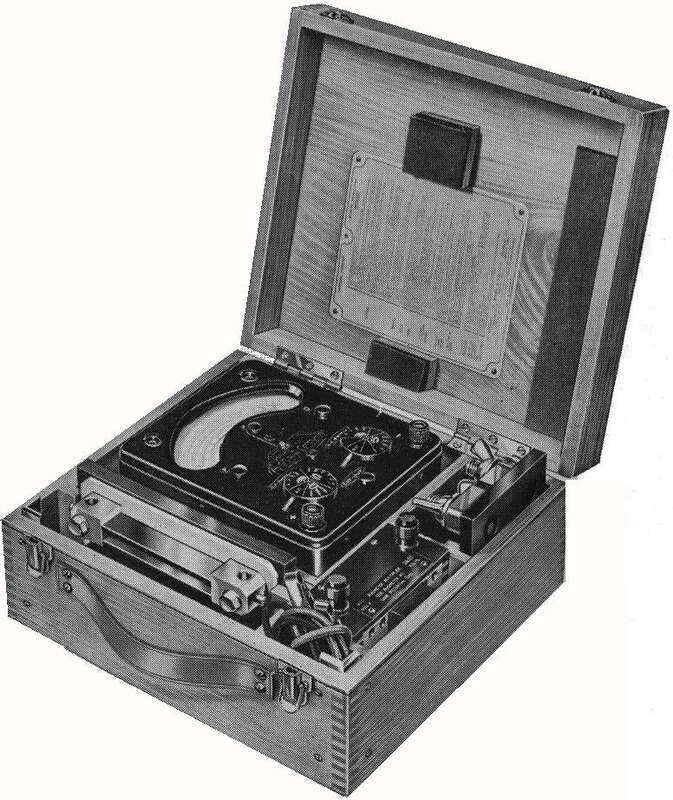 The case and battery compartment on the later model 8Mk4 and model 9Mk4 are shown here. Similar to the design adopted for the subsequent models. New internal and external design including movement, the new plastic front-panel no longer includes the word "Universal" Plastic casing redesigned. Leather carrying handle abandoned for a plastic one. Instrument much lighter than all previous models. Resistance Range unit.) 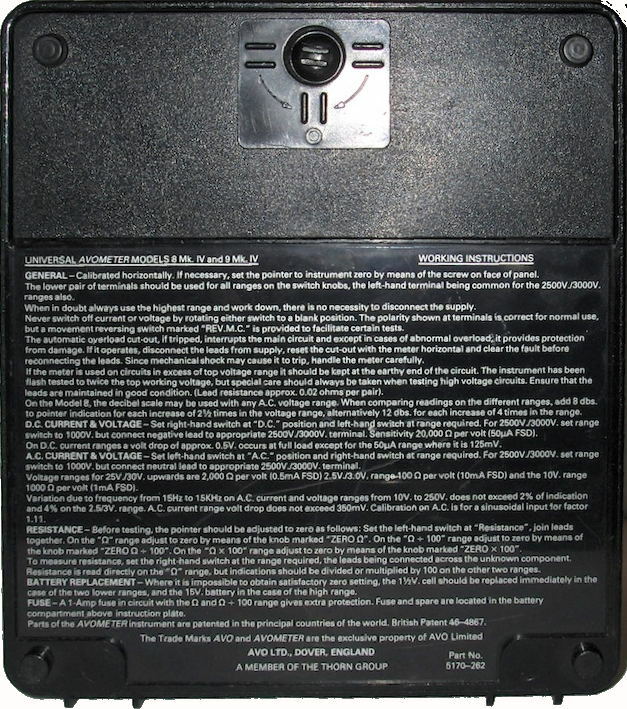 Adopted Model 9 ranges and added 600 volts AC range. 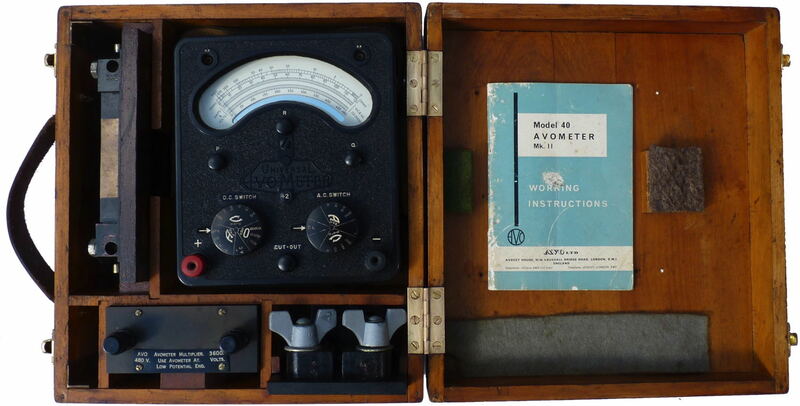 The Model 14C Avometer is a Model 8 Mk5 made to a British Post Office specification. 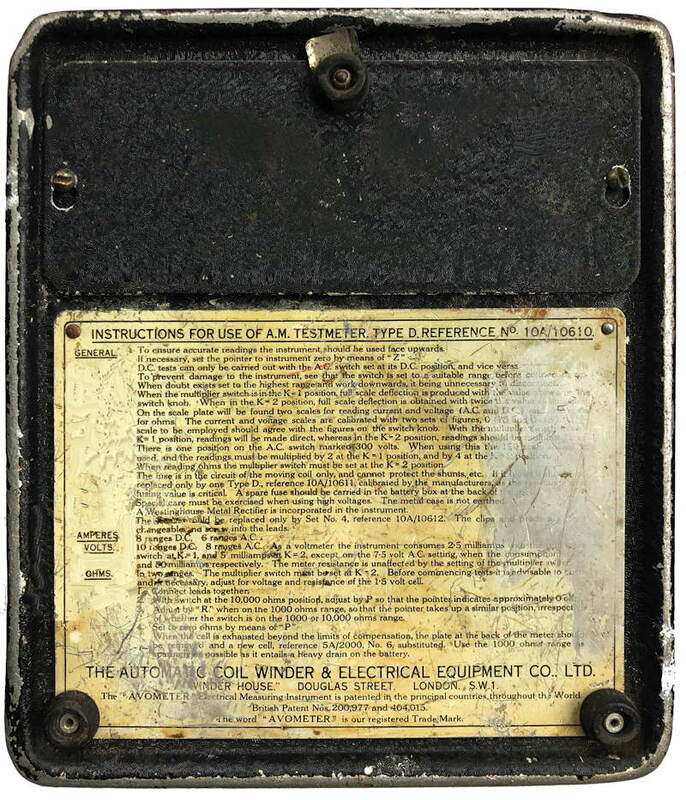 It is essentially the same apart from front panel markings and a different instruction plate on the back. 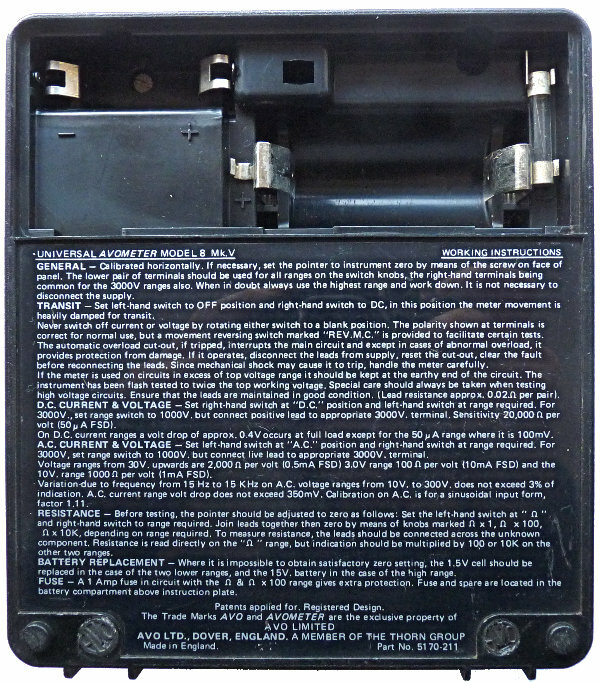 The battery compartment on the Mk4 and subsequent models was accessed from the back rather than the top. 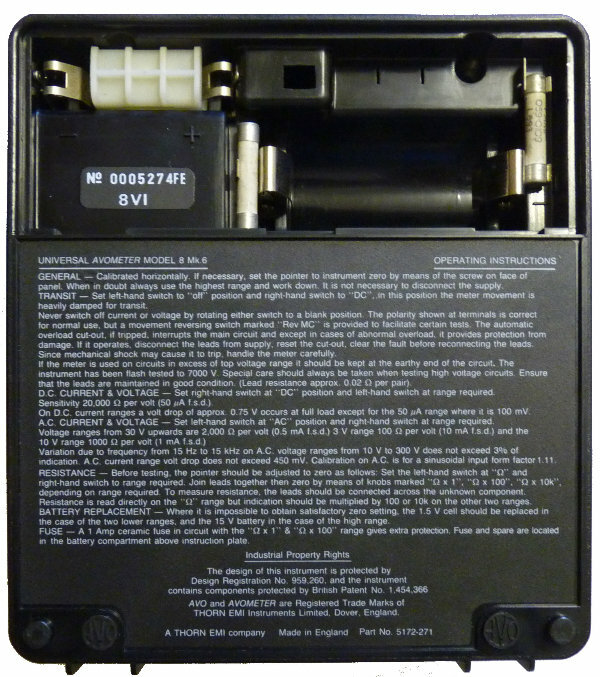 The ribbed plastic housing is used to surround the cylindrical 15 Volt battery and keep it in place. The spare fuse is in the centre. New internal design using rigid PC boards (less rugged) instead of flexible wiring. 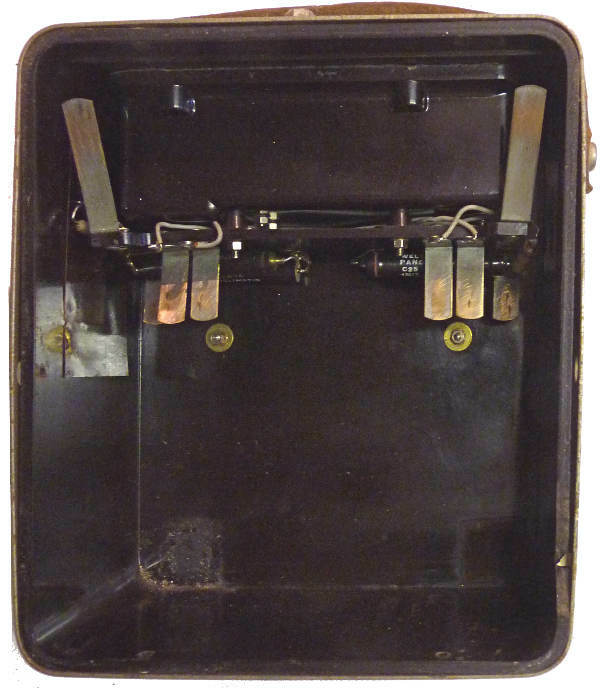 Deleted high-voltage terminals. 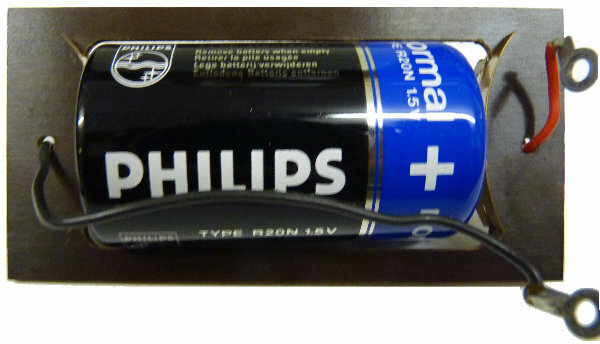 The ribbed plastic housing is used to surround a cylindrical 15 Volt battery and keep it in place. 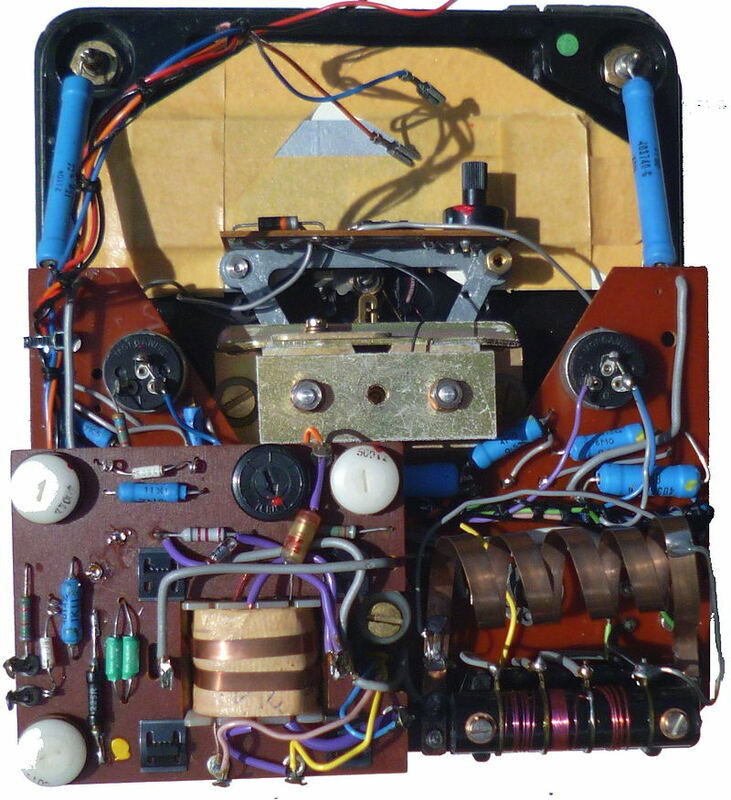 Only change from the Mark 6 was the addition of a 10 A fuse in series with all ranges. D.C. Voltage ranges 0.3% of f.s.d. The accuracy on a.c. voltage and current ranges is 0.75% of FSD (form factor of 1.11) This accuracy is maintained for audio frequency tests up to 1 kHz on ranges up to 3OOV. 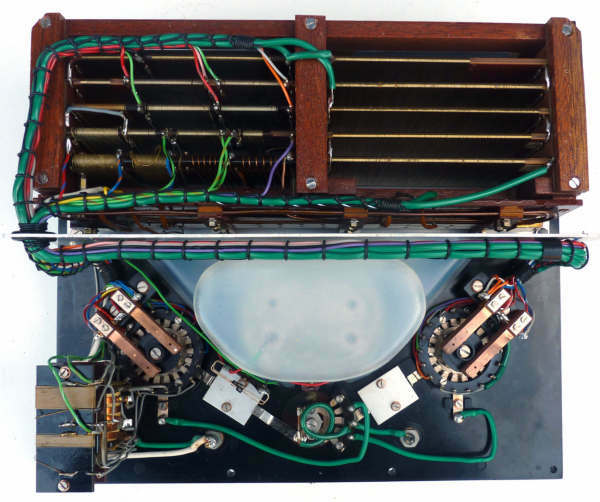 The Welwyn blue high stability precisiion resistors were introduced by AVO in about 1968 to replace the wire wound types used on previous models throughout their range. 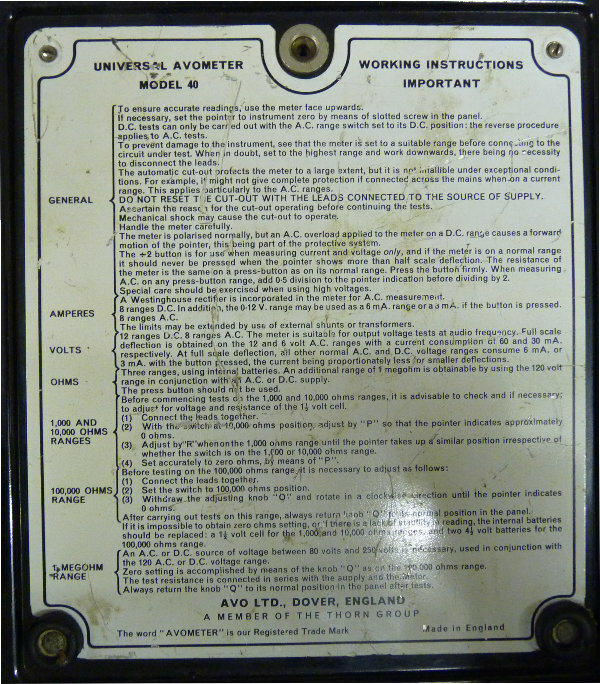 Just to give you all an idea of variants of the Avometer. There are some interesting variants here that may have only ever had small production runs. Thanks to Andy Gilham (Megger/AVO) for this list of official variants. Please be aware that the number of build variants actually runs into 100s, with different component values, lacquer changes, number of windings on the transformers....etc. 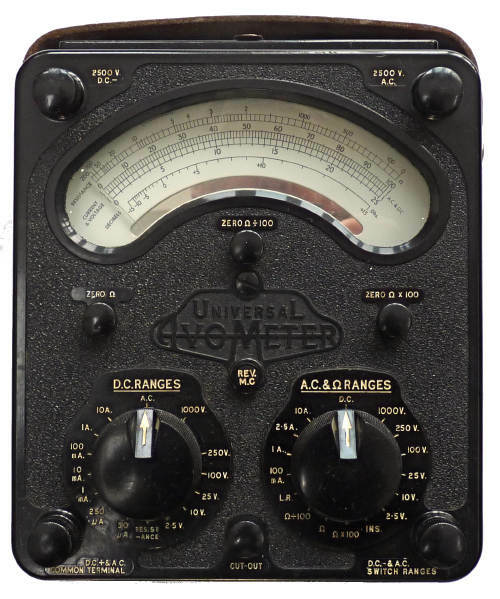 Each model is assumed to have been discontinued when the next of that model was introduced, except that the DC Avometer was produced in parallel with the Universal until the Model 40 replaced both in 1939, just after the start of the war. Also, some of the military versions persisted longer due to specifications. 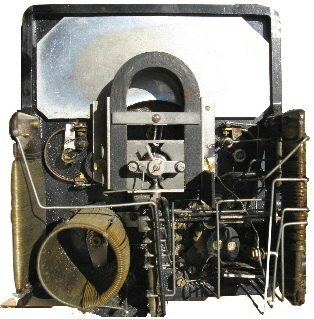 The Model 8/9 was not intended to be a replacement for the Models 7 or 40 outside of electronic work. 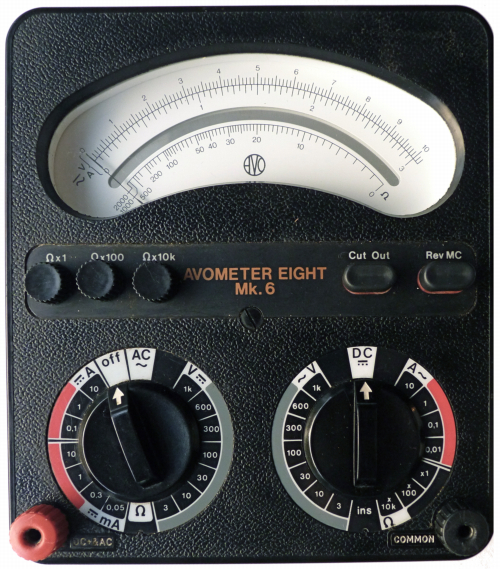 Aside from the different ranges and sensitivity, the 8/9 were less accurate, at least until the Mark 5 which represented a significant improvement (it was still slightly worse on high resistances due to not having a Q knob, and on all resistances due to ranging by factors of 100 rather than 10). The 8/9 also took considerably more voltage on DC current ranges; due to the universal shunt being the same as used for voltage, the burden on current ranges other than the lowest had to be at least 4 times that of the movement, i.e. 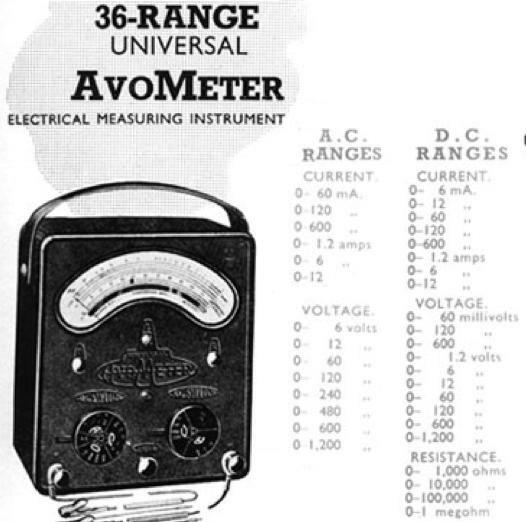 0.5 V before the Mark 5 and later 0.4 V.
On the DC AVOmeter, Universal AVOmeter, and Model 40, the reverse could be done and the lowest DC voltage range (120 mV) be used as a current range (6 mA). Higher resistances could be measured with external power, and zeroed using the Q knob. 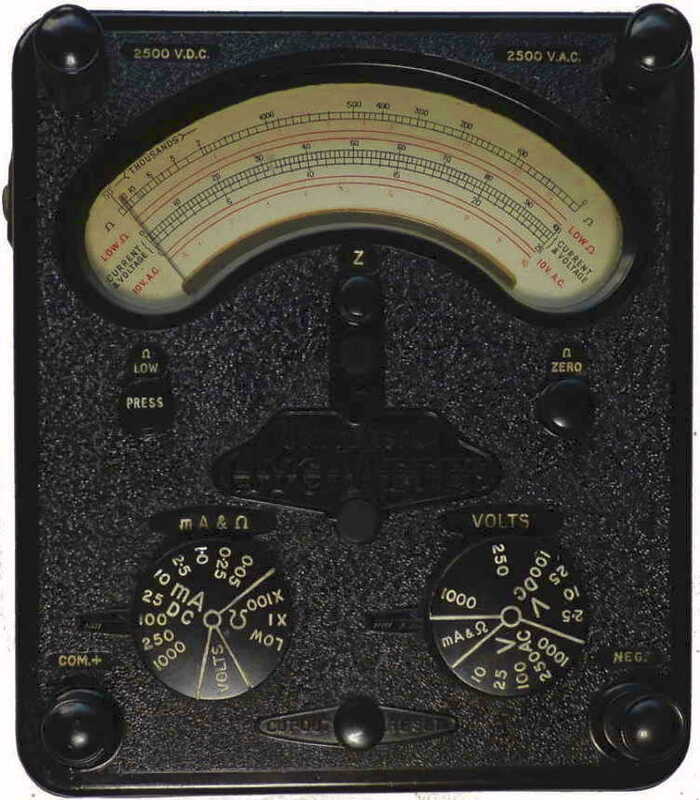 On the Model 7, the 100 and 400 volt ranges could be used as the '10 and 40 megohm' ranges (50k and 200k center). The adjustment range of the Q knob was wide enough to use 240v mains on the former. 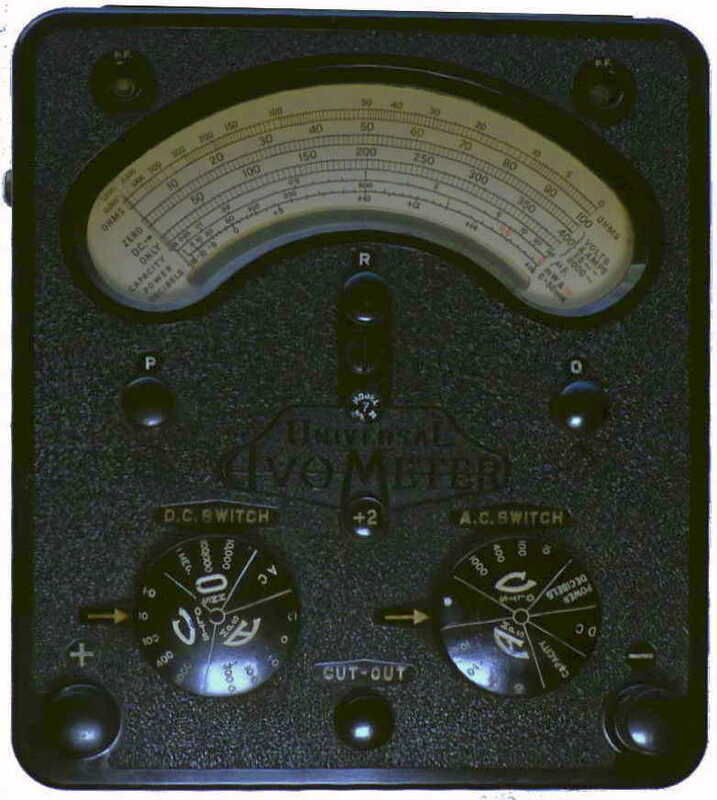 The Model 40 was similar, having a stated '1 megohm' range using the 120 volt range (again 240v mains could be used). Images other than those of the meters in my possession have been gleaned, cleaned up and resized from various sites on the internet. Others including Paul Thomas, Dave Philpott, Hans Caluwaerts and Sean Mckinney have made comments and provided information which has now been included.